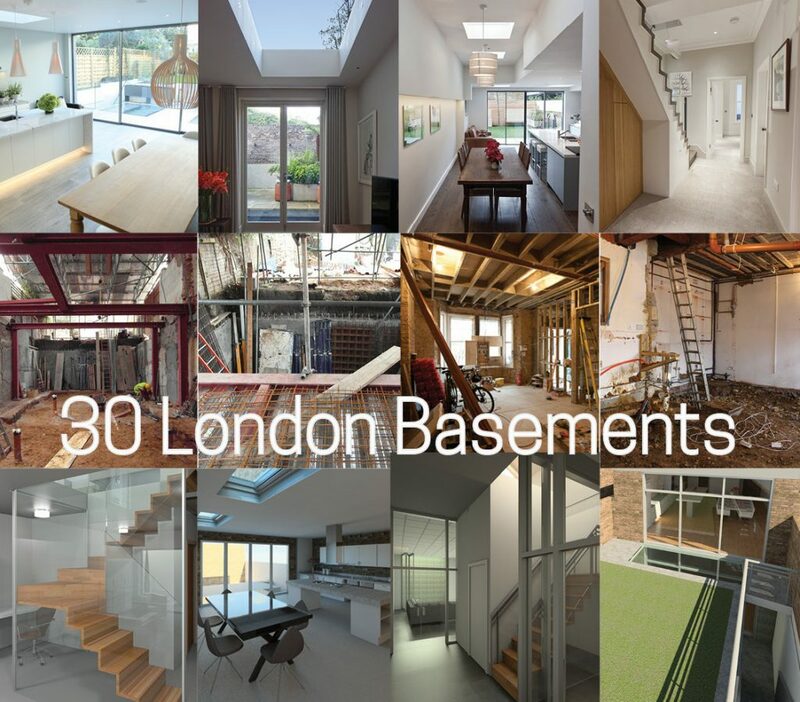 Shape Architecture has now worked on over 30 London basement projects. 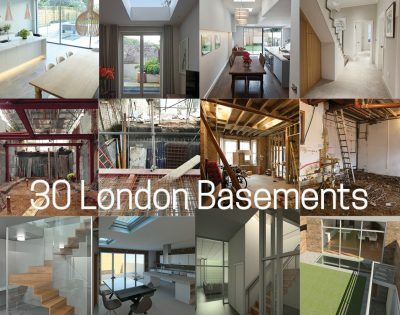 Given this breadth of experience we have put together a brochure of 30 London basement extensions that describes our work in this area. 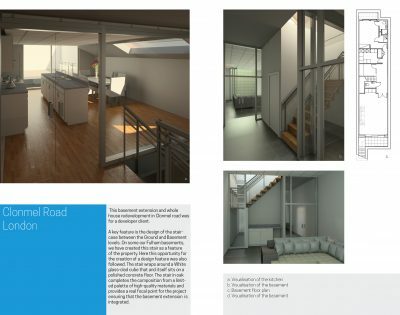 We show various photographs, computer visualisations and 2D basement plans. 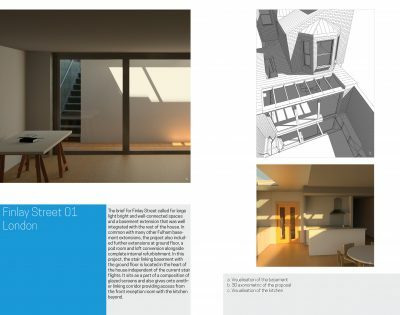 Each project is different whilst exploring the common themes of maximising daylight, linking the basement to the ground floor and the merging of inside and outside spaces. Behind each project are many further variations all of which help to inform every subsequent project. 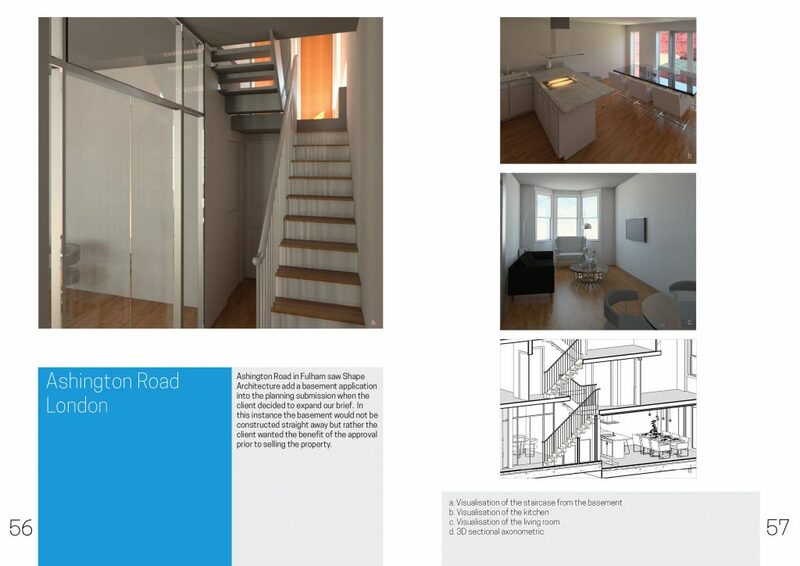 As London architects equally important is the team of other professionals that we work with on all of these projects. 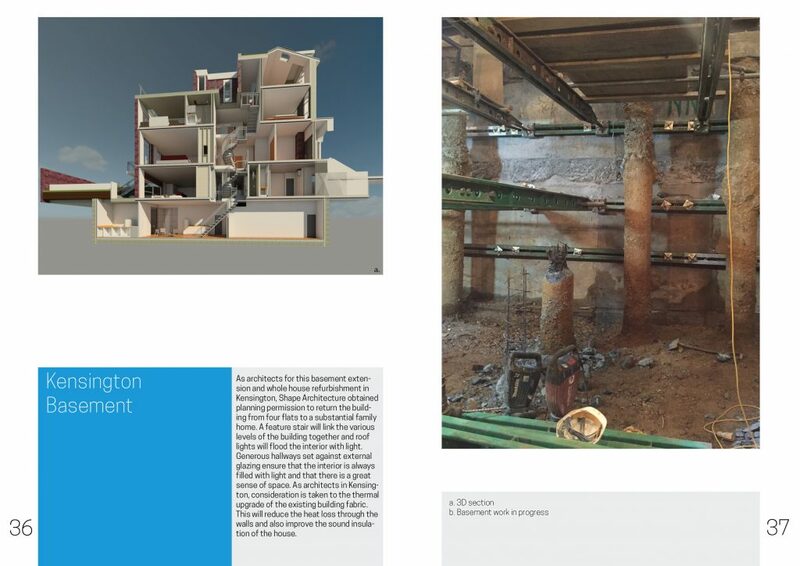 Over our time working on various residential projects we have established working relationships with numerous professionals especially structural engineers that have ensured an efficient, creative and fulfilling process. 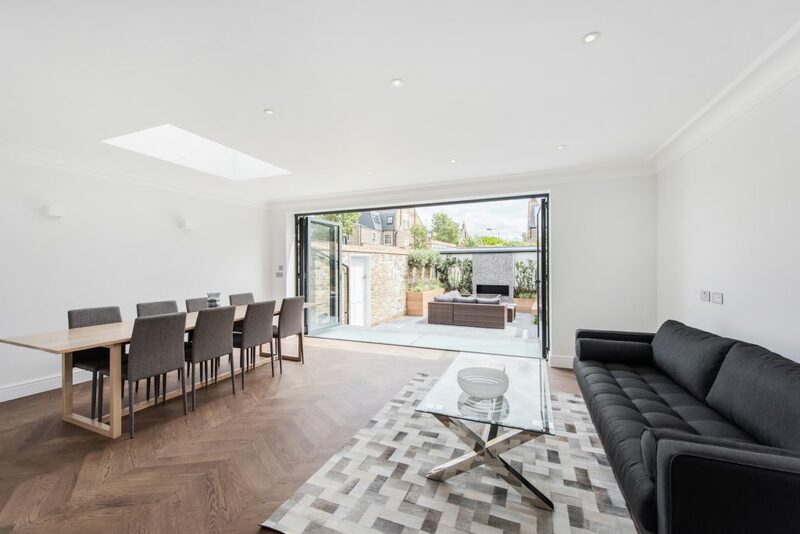 We are able to advise on the appointment of a whole range of consultants that we work with, from those above to party wall surveyors, kitchen designers, lighting designers, AV consultants and many more. From our wealth of experience we are able to advise companies we will have worked with before and whom help us deliver the desired result. 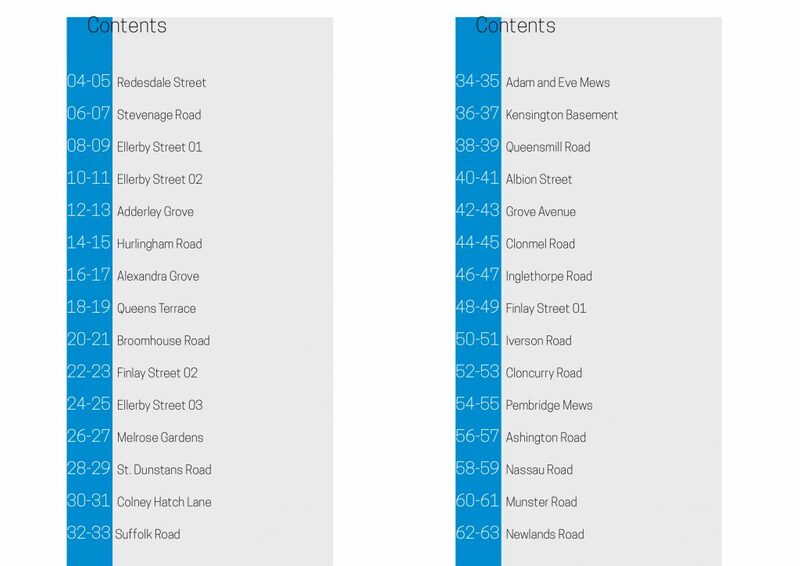 Our basement projects are located in Kensington, Chelsea, Fulham and Barnes. 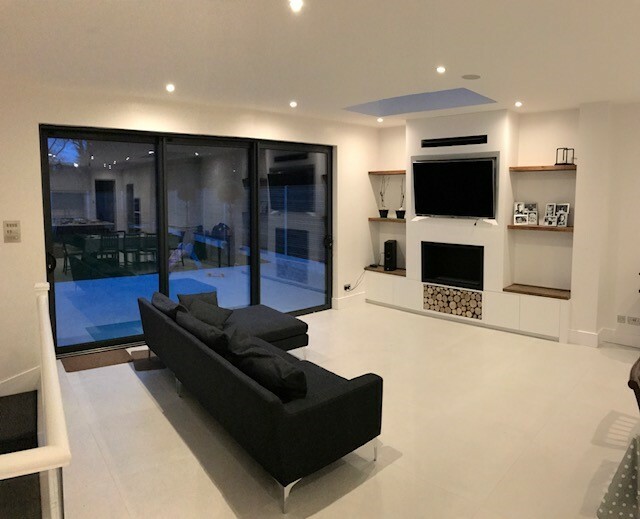 We undertake all types of projects types and sizes from basement conversions with refurbishment to the ground floor level, to basement and whole house conversion. 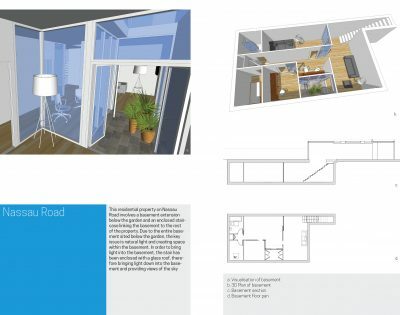 Most of our projects are centred around a whole house conversion and will typically involve the addition of a side and rear extension, a pod room and loft conversion alongside the complete internal refurbishment with works to front and rear gardens also. Shape Architecture explores the issues of light, space and transparency in its work alongside the physical and visual connections between the inside and outside. 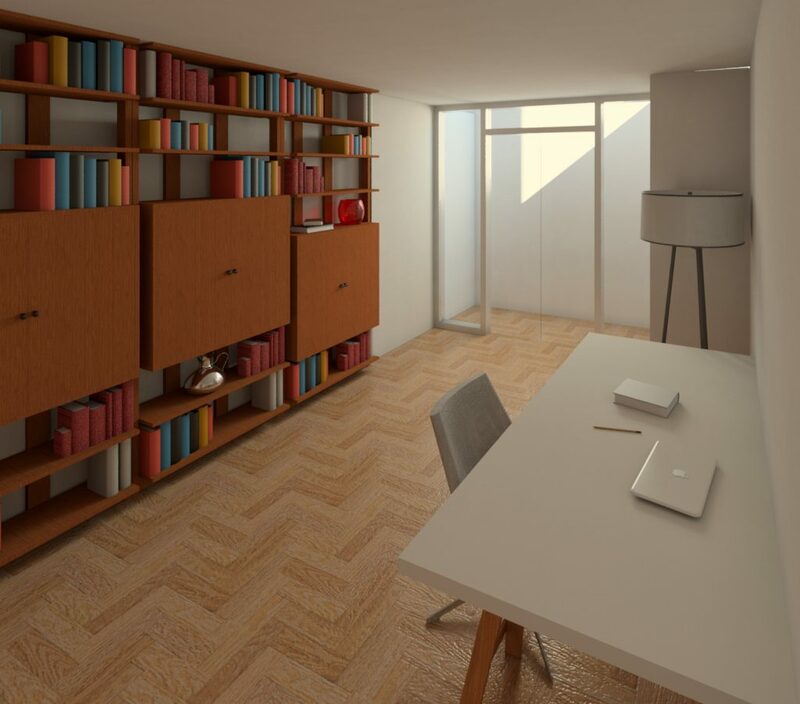 These issues are also central to the success of a basement conversion project where these qualities are paramount in the experience and use of space. 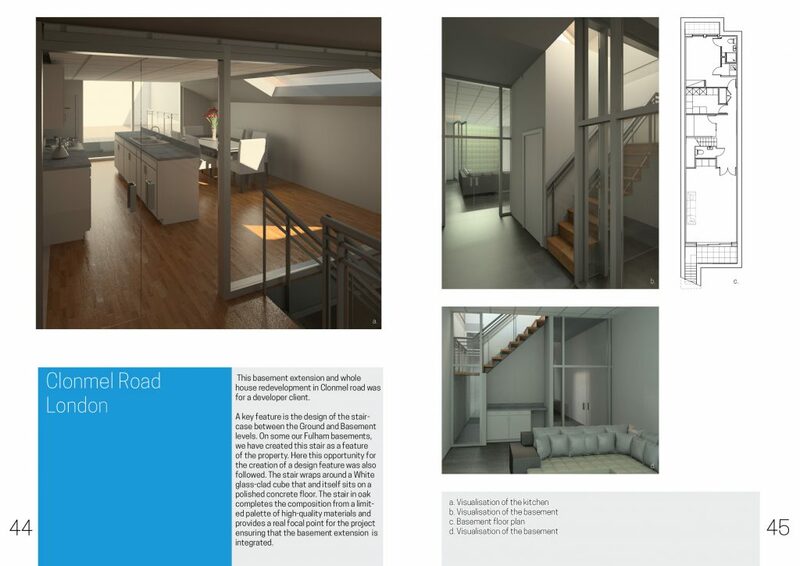 Our project on Redesdale Street was acquired through client recommendation. 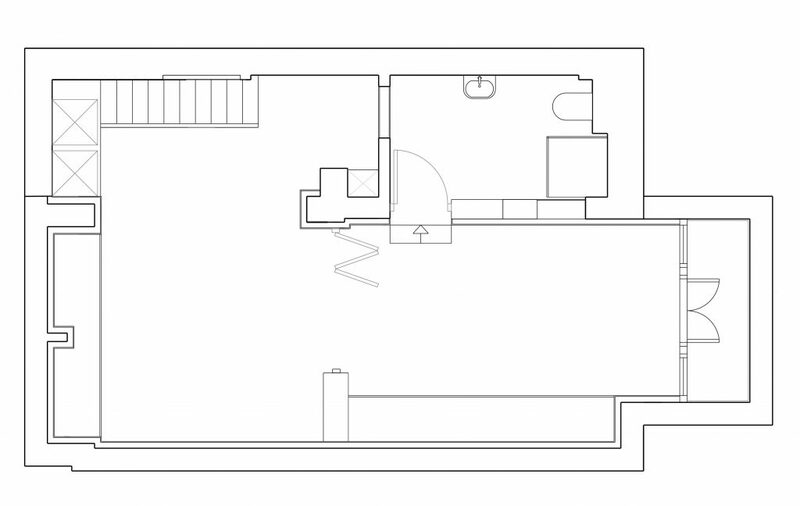 As well as a basement extension, a side return extension has been added to form a simple rectangular floor plan. 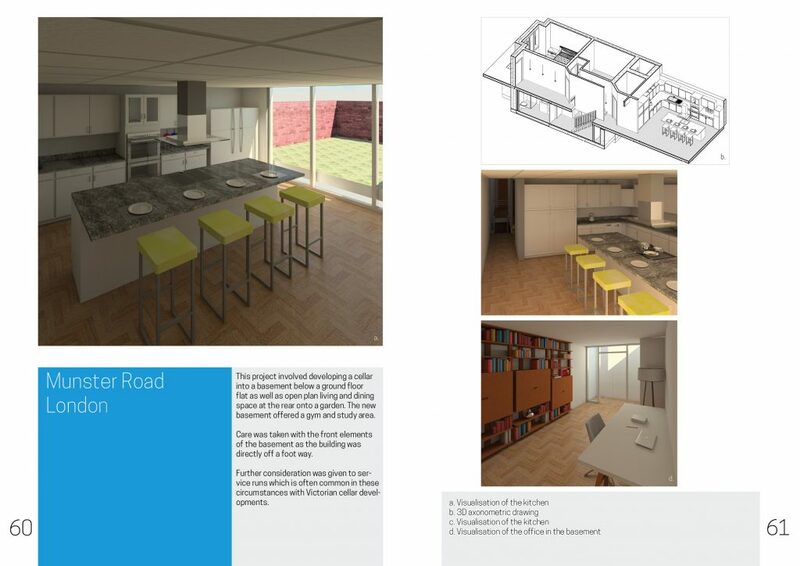 This space provided living, kitchen and dining areas. 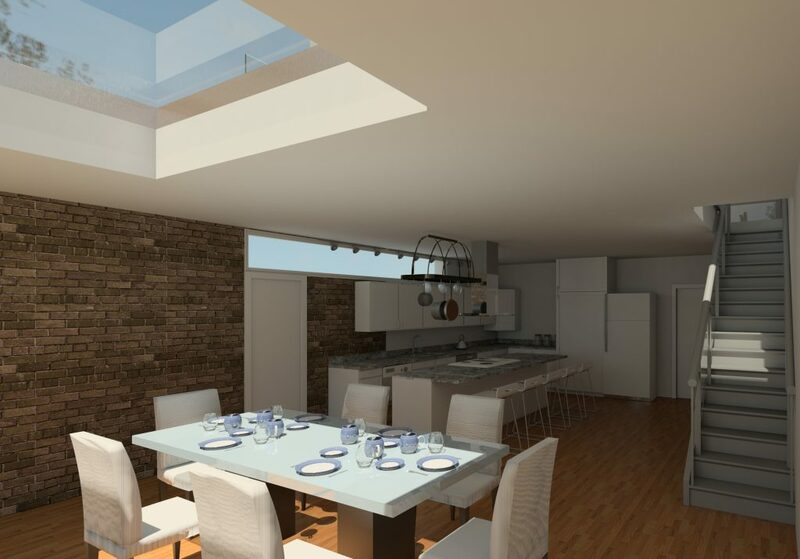 There is a lightwell situated above the dining table which provides additional natural light. 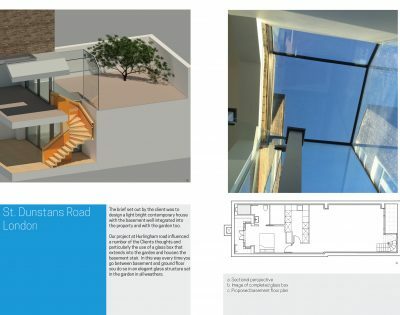 A glass platform sits over the lightwell and connects the interior to the garden. 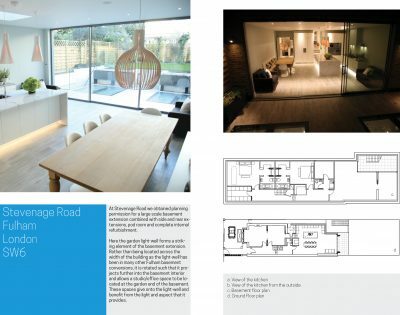 At Stevenage Road our work consisted of a large scale basement extension as well as internal refurbishment and a side and rear extension. 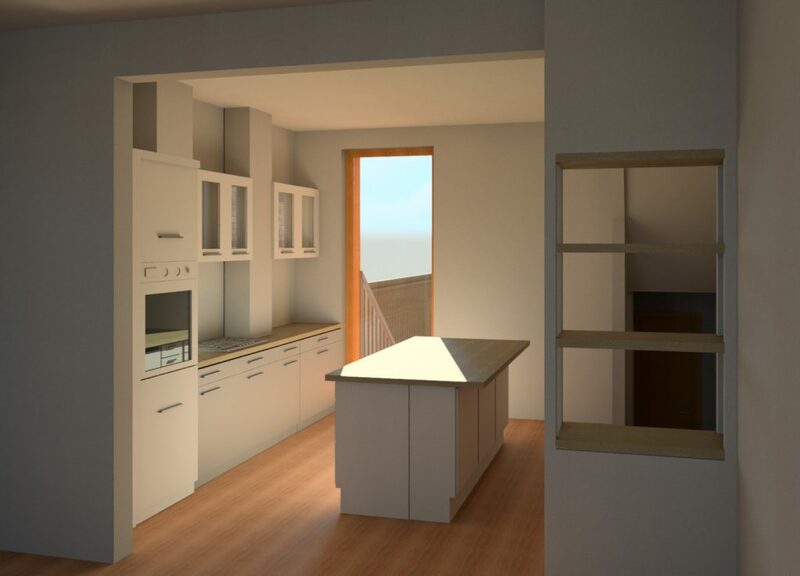 The side and rear extensions combine to create a spacious and light kitchen and dining space. 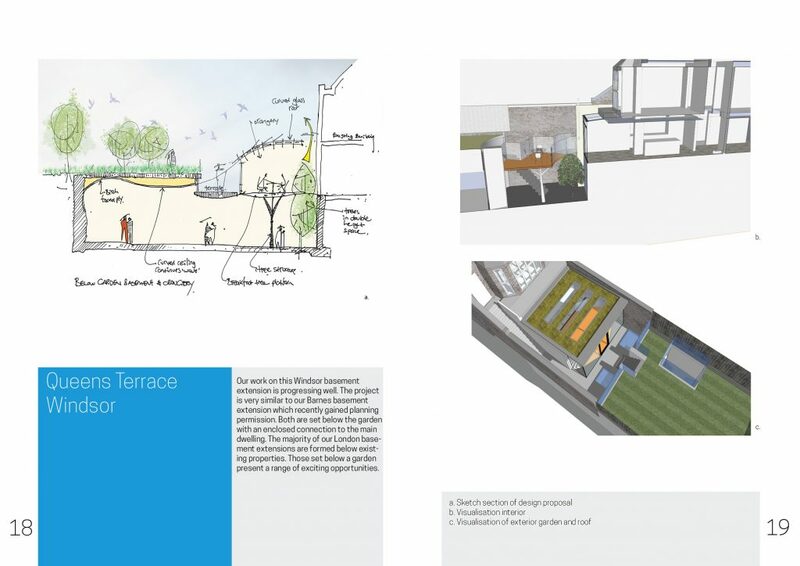 Furthermore, there is a lightwell located across the width of the building forming a striking element of the basement extension. 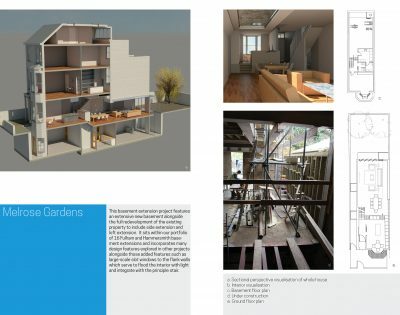 This project involves the addition of a large basement with front, rear and middle light wells, a side and rear extension at ground floor, a pod room at the upper level and the complete internal refurbishment. 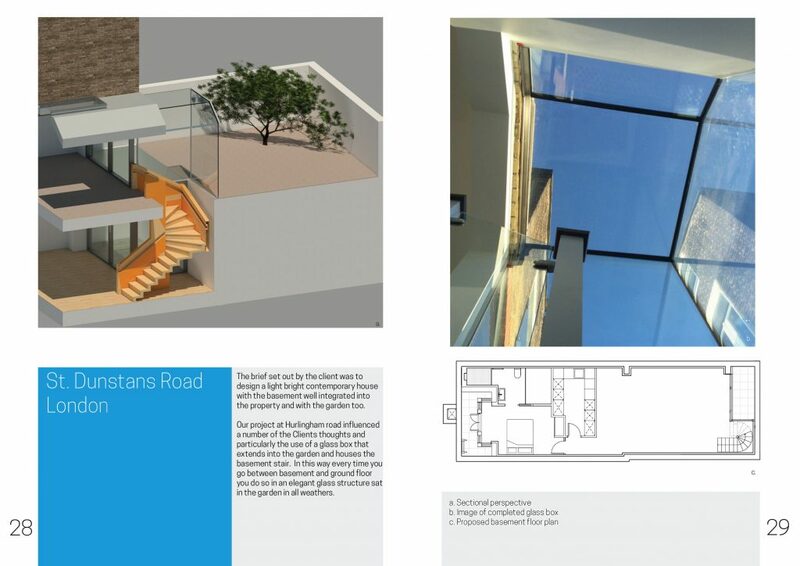 Connecting the interior with the garden is a an elegant glass box with a woodenstair leading up to the glass bridge over and provides a direct route to the garden. 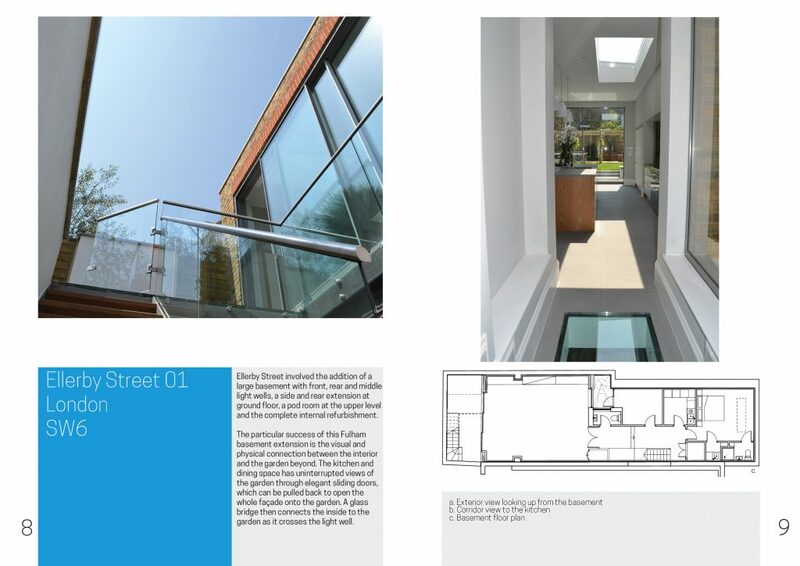 As Architects in London, this project was our third project on Ellerby Street. 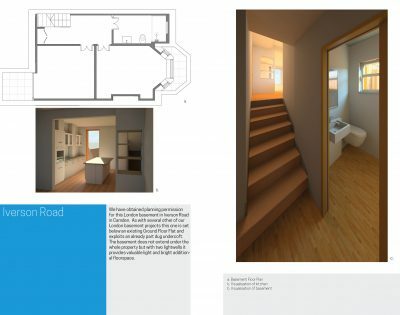 In this project consisted of a rear and side extension which formed part of the new basement. 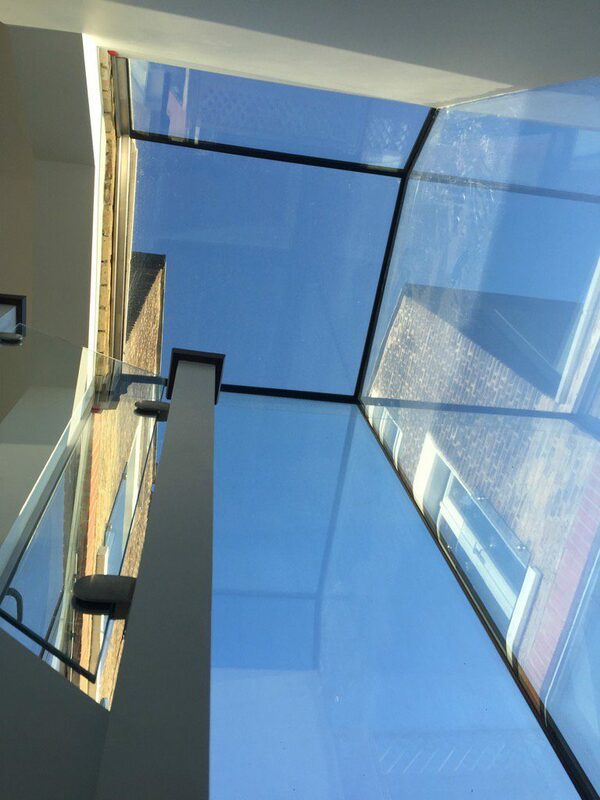 A new flat roof construction was formed with a large roof light set into it over the location of the new internal basement stair. 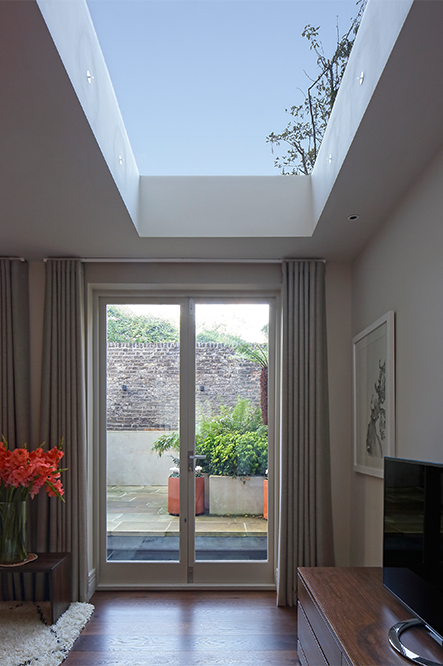 A series of small light roof-lights were installed to ensure the basement benefited from plenty of natural light. 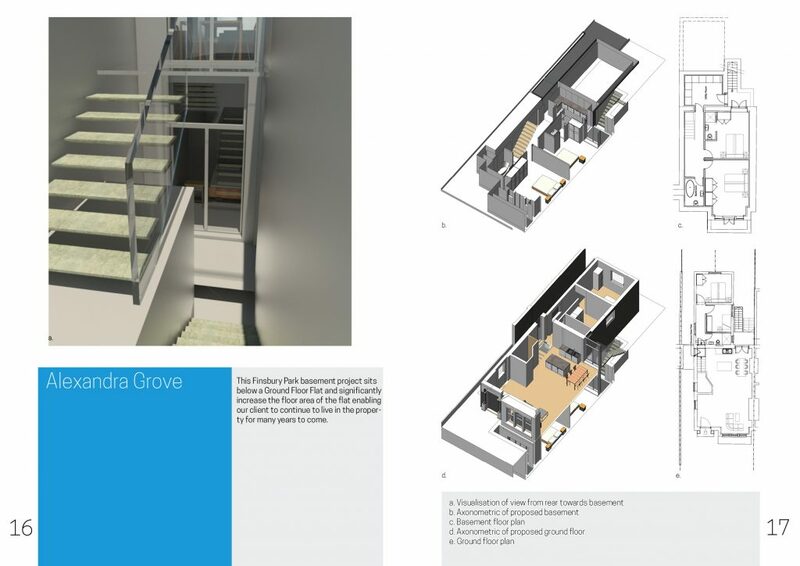 The basement stair is within a generous void located in the open plan kitchen. 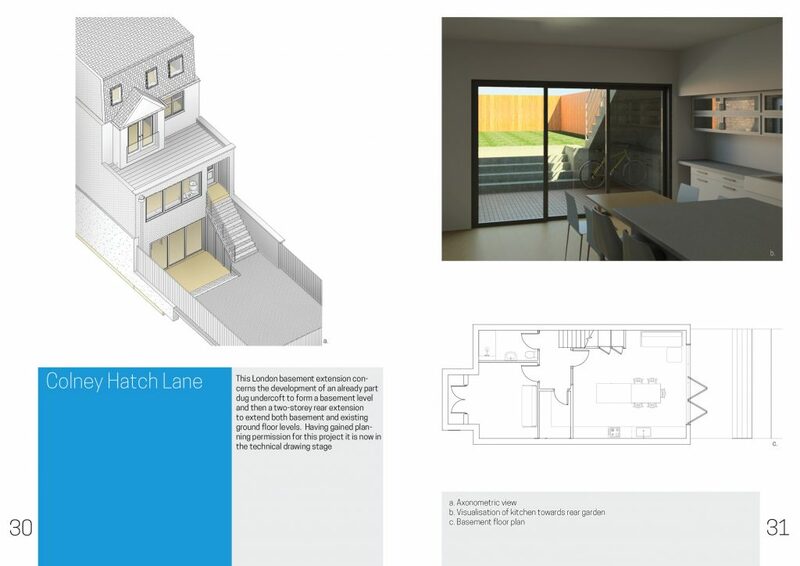 Located in the centre of the basement plan it helps create a light and spacious feel to the basement extension on moving from the Ground floor to the basement below. 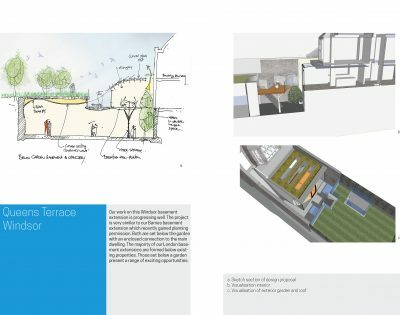 Our Wandsworth basement project in Adderley Grove has been granted planning permission and features a below garden gym space in addition to the full plan basement. 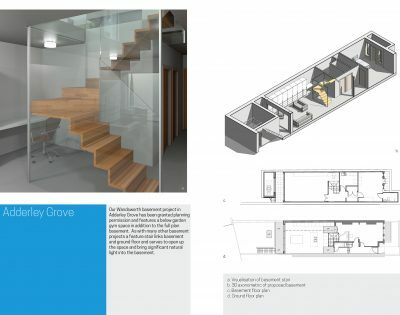 As with many other basement projects a feature stair links basement and ground floor and serves to open up the space and bring significant natural light into the basement. 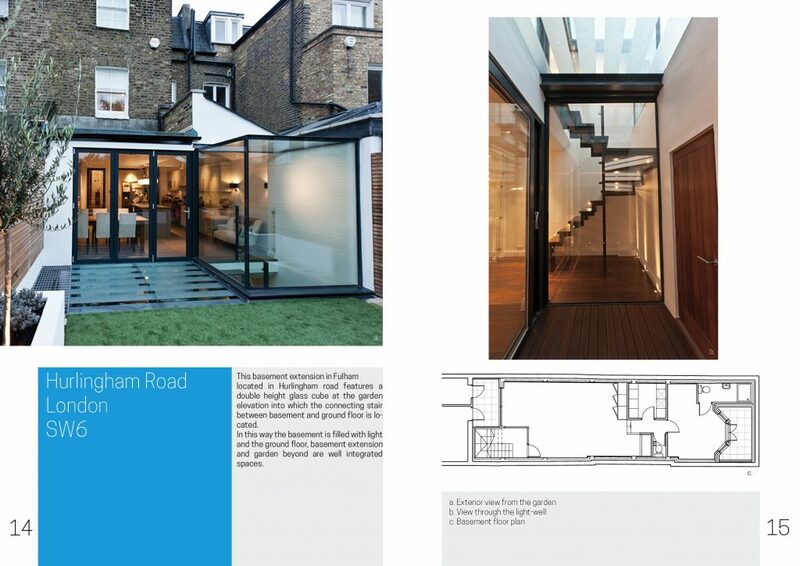 This basement extension in Fulham located in Hurlingham road features a double height glass cube at the garden elevation into which the connecting stair between basement and ground floor is located. 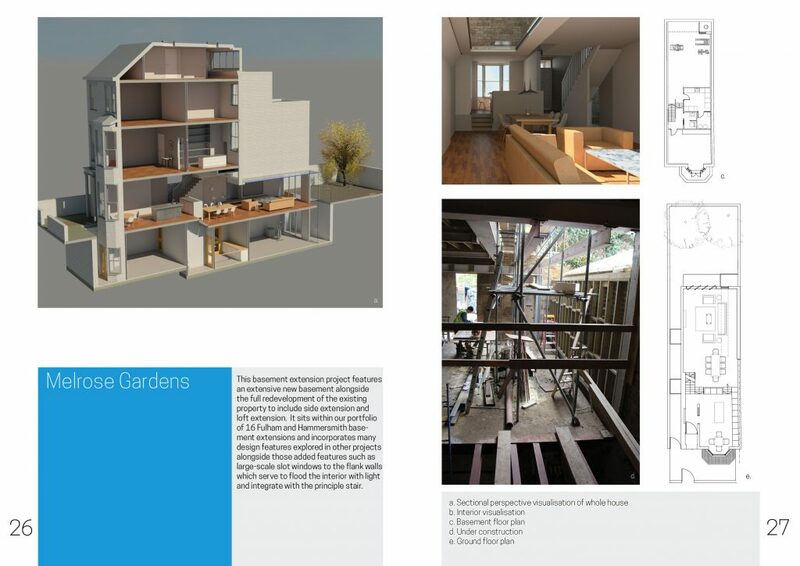 In this way the basement is filled with light and the ground floor, basement extension and garden beyond are well integrated spaces. 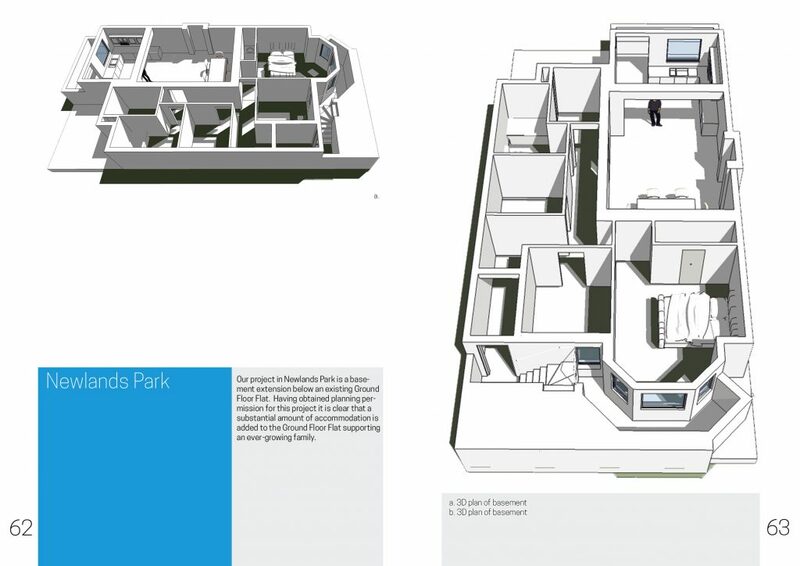 This Finsbury Park basement project sits below a Ground Floor Flat and significantly increase the floor area of the flat enabling our client to continue to live in the property for many years to come. 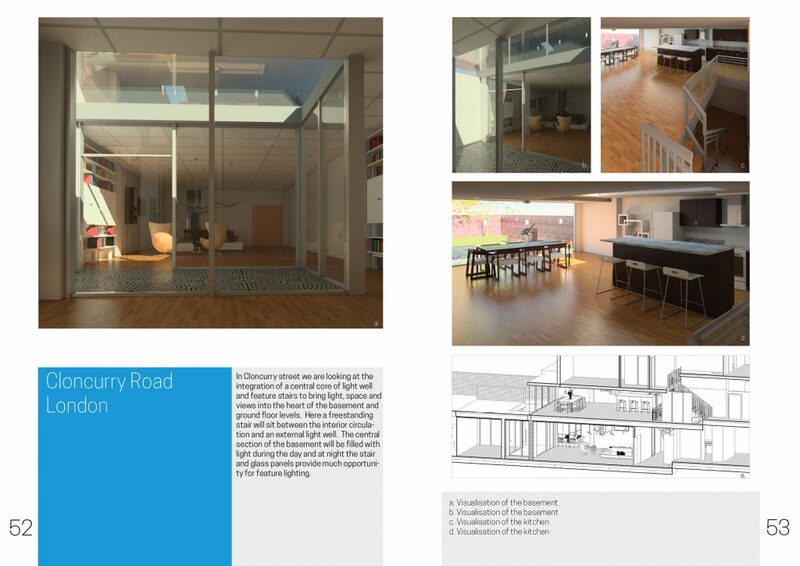 The project is very similar to our Barnes basement extension which recently gained planning permission. 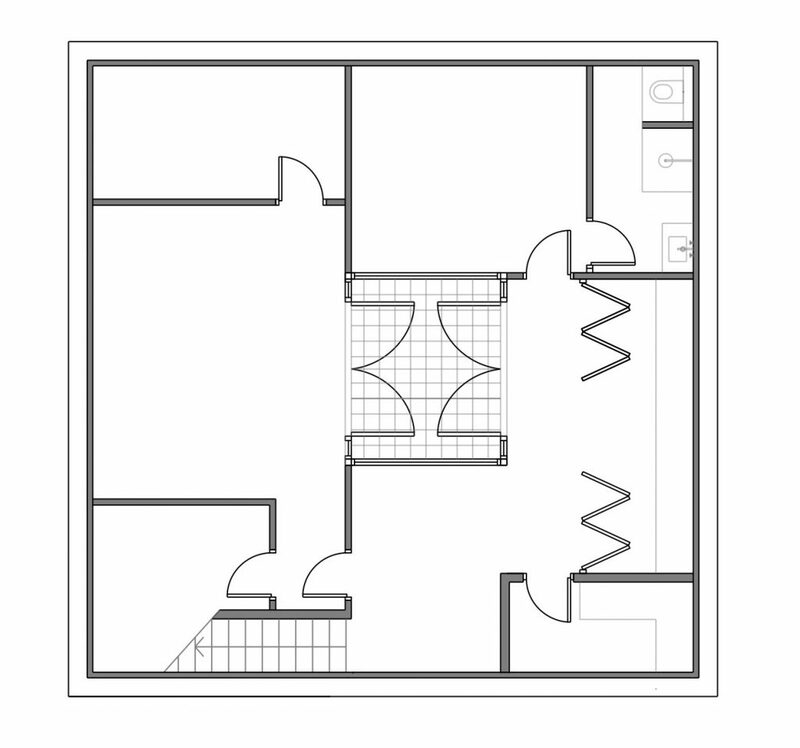 Both are set below the garden with an enclosed connection to the main dwelling. 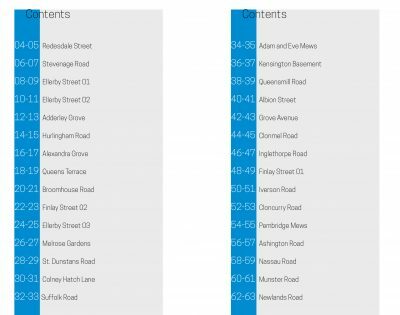 The majority of our London basement extensions are formed below existing properties. Those set below a garden present a range of exciting opportunities. 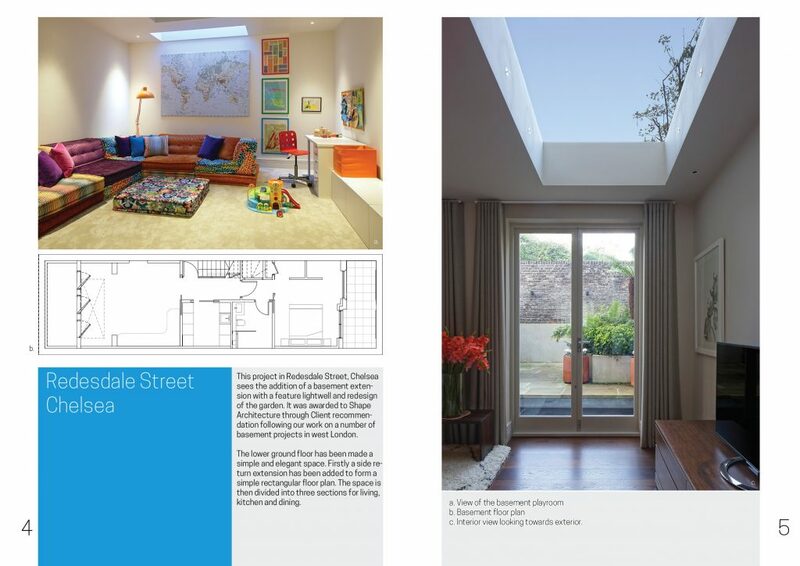 This basement conversion in Fulham is successful in creating a light and spacious contemporary interior. This project consisted of a side return and rear extension along with the basement extension. 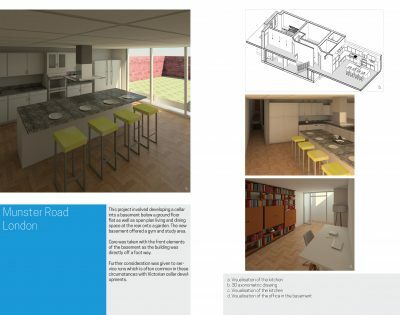 The rear extension allowed for a large kitchen and dining space. 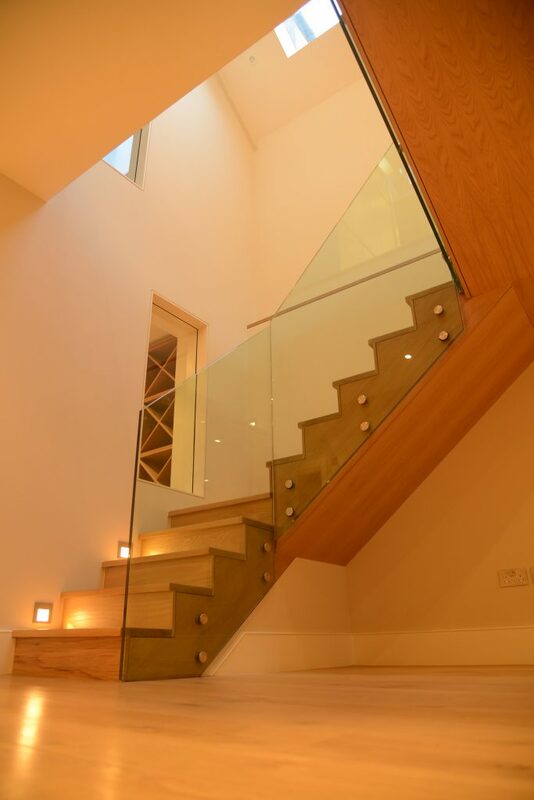 Unlike other basement projects in London, the stair is located in an open plan configuration, following the existing flight of stairs. 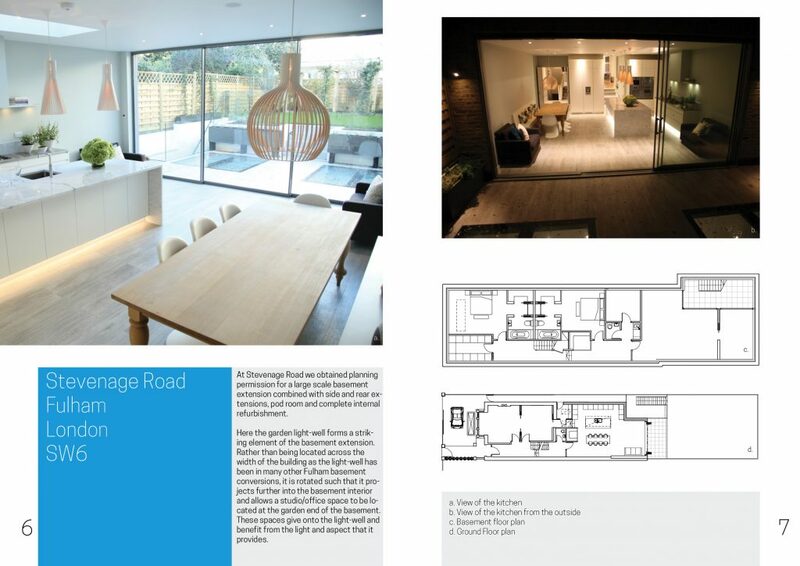 Additional width was added to this L shaped Victorian property to allow for a good size kitchen and dining space. 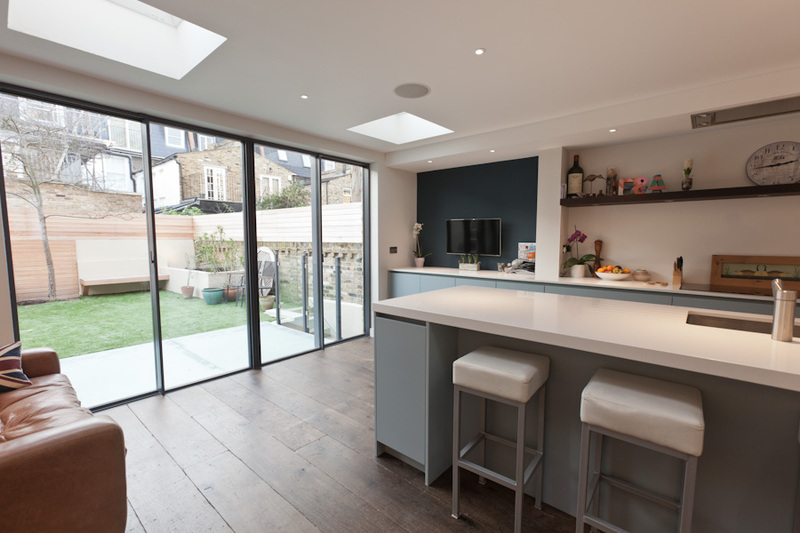 At the rear of the new extension, many projects specify bifold doors centrally aligned. 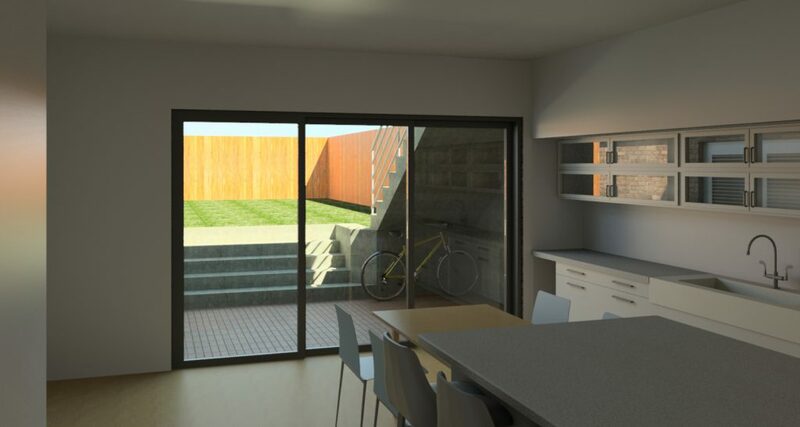 When opened fully, the new door configuration completely removes the division of External and Internal space, allowing uninterrupted views of the garden from the dining area. 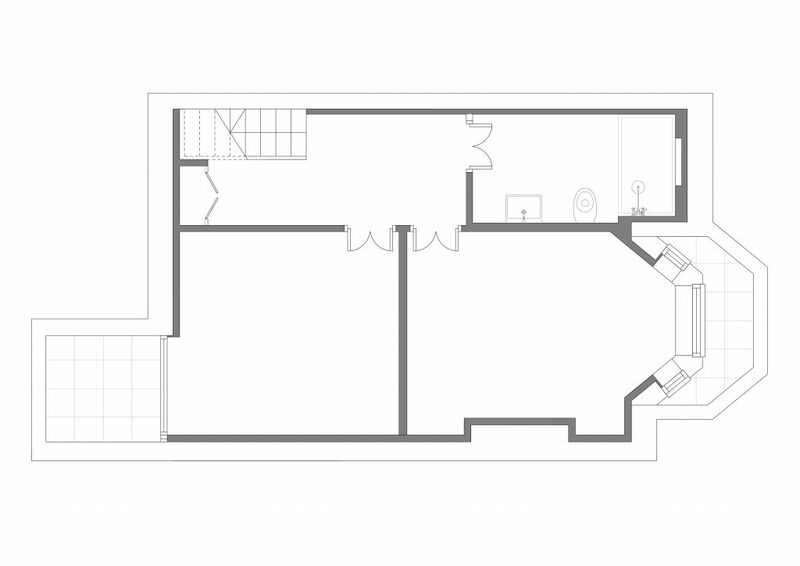 The basement sits below the ground floor extended footprint. 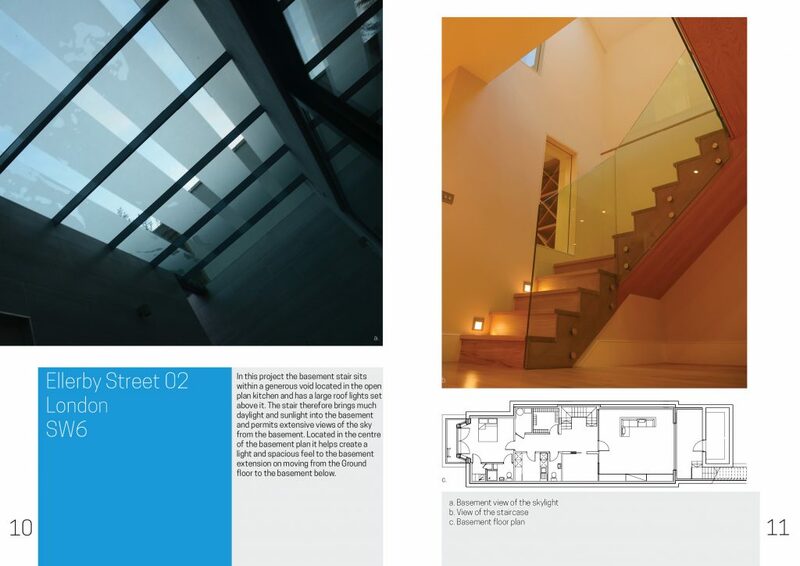 This project was the first basement conversion project undertaken by Shape Architecture. 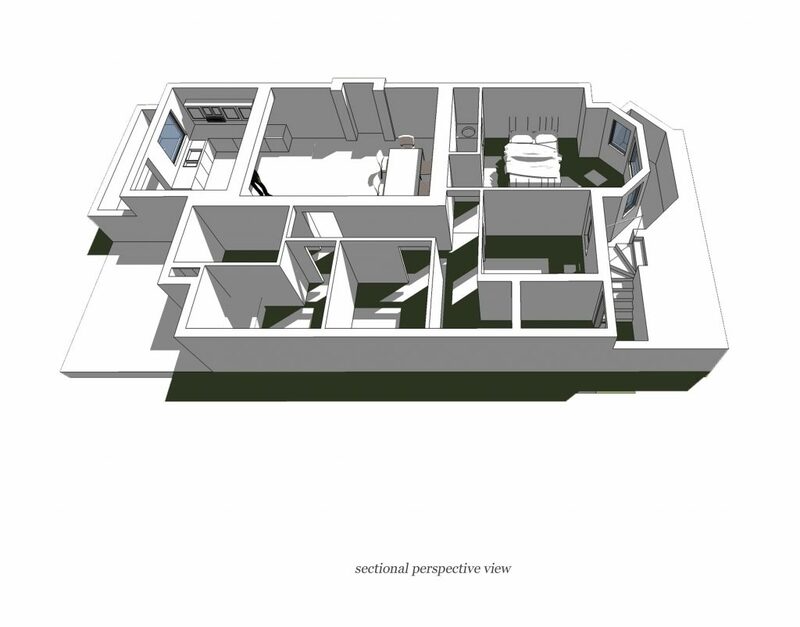 The addition of the basement provided a wide range of new rooms including a new large family room and utility room. 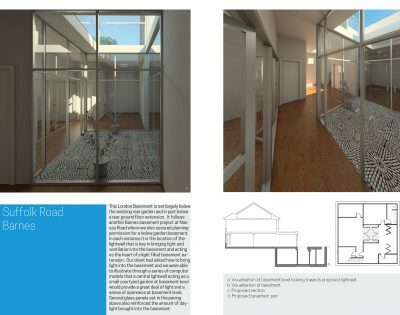 The family room faces onto the garden lightwell and has direct access on the lower level to the garden. 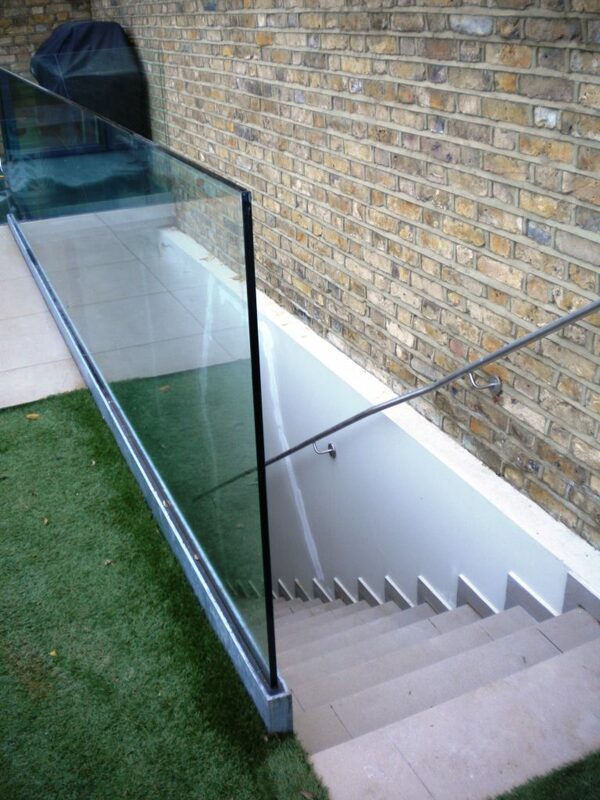 Connecting the ground and basement floors is a feature stair that is incorporated with a glass bridge. 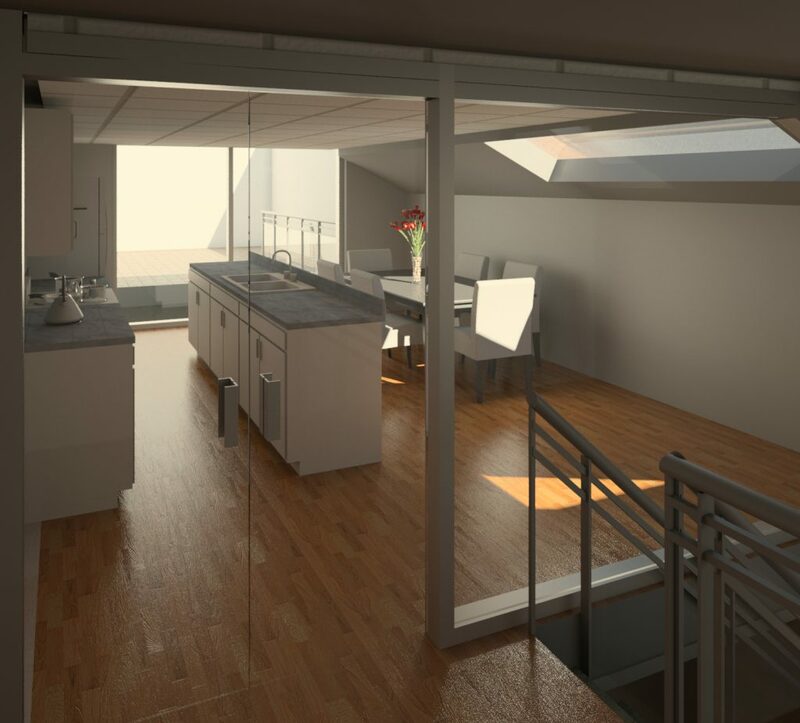 This basement extension project features an extensive new basement alongside the full redevelopment of the existing property to include side extension and loft extension. 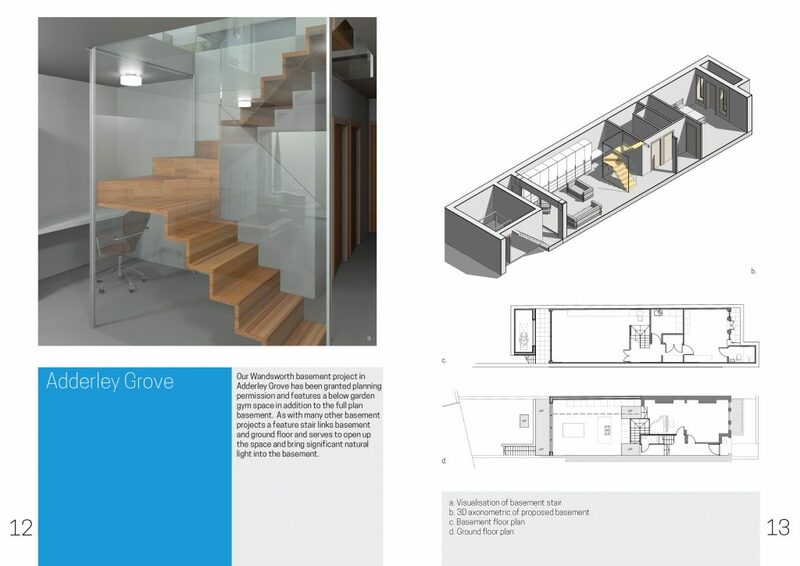 It sits within our portfolio of 16 Fulham and Hammersmith basement extensions and incorporates many design features explored in other projects alongside those added features such as large-scale slot windows to the flank walls which serve to flood the interior with light and integrate with the principle stair. 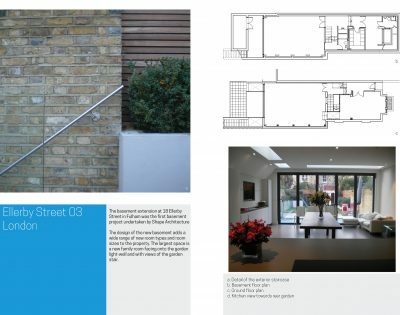 As architects in Fulham, our brief set out by the client was to design a bright contemporary house with the basement well integrated into the property. 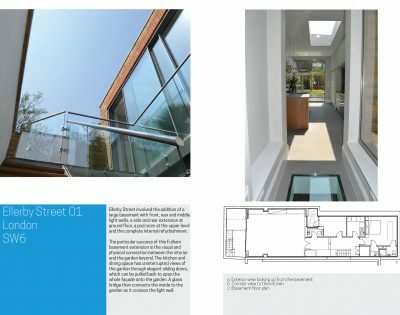 This project was influenced by our project in Hurlingham Road where the use of an elegant glass box that extends into the garden and houses the basement stair. 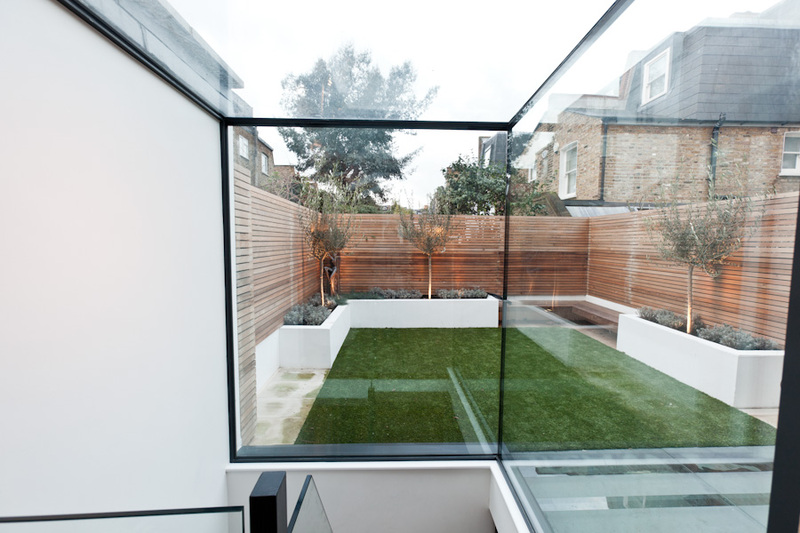 This glass box can be seen as soon as one enters the house as the interior at ground floor flows into one large naturally lit space with excellent views of the garden. 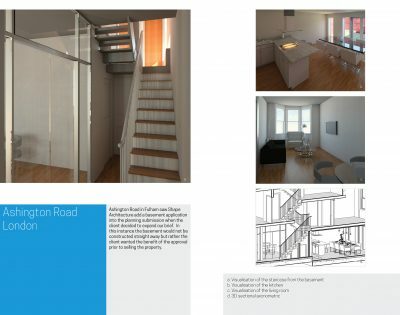 Each project in our portfolio is different and we relish uniqueness of design; approaching each project with a fresh perspective and vigor. 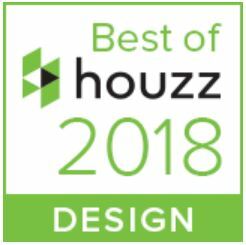 We work with clients closely though the design stages to create a project that reflects our clients brief, budget and site conditions. 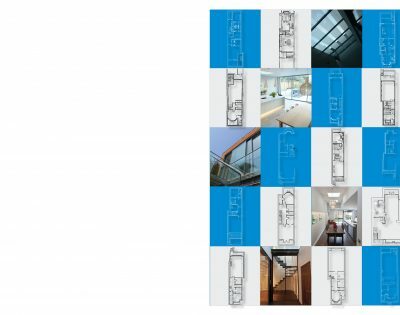 The success of these projects has been in the creation of light filled interiors which we have explored in a wide variety of ways through use of material and form. 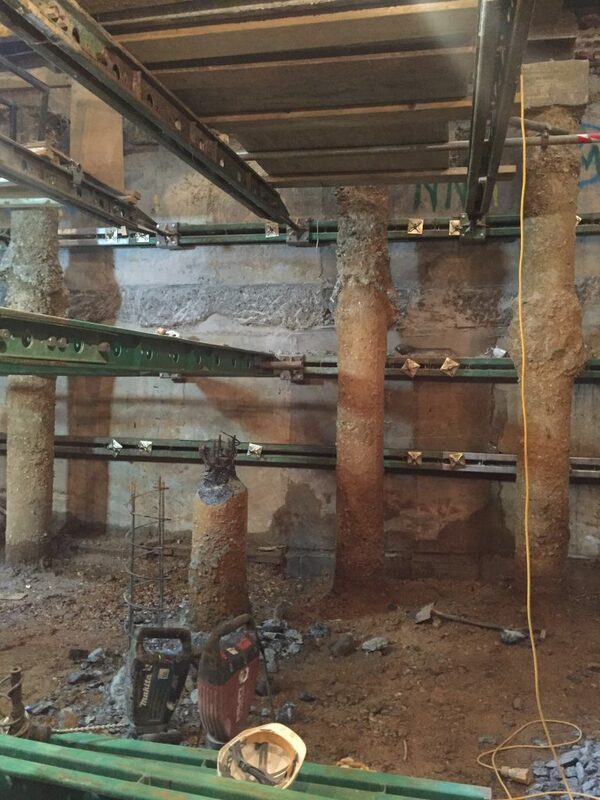 The rear and front sections at basement level are formed as light wells. This prominently allows light and air into the basement, but also offers access and views out. These are also key design features that provide much interest. 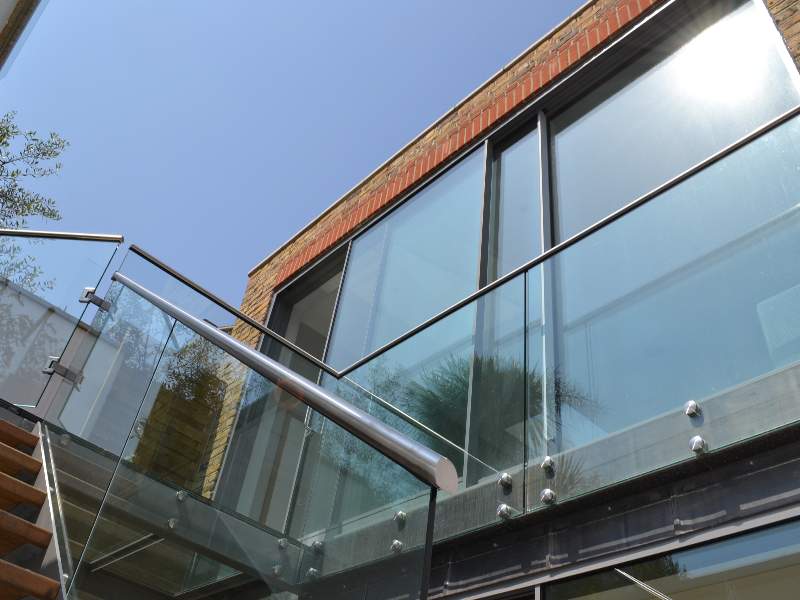 The treatment may vary from glass bridges over the light well that can connect to an elegant stair, to running the internal stair in a glass box within the light well and much else besides. In many projects we have also introduced a third smaller light well at the heart of the basement. This has been very successful in bringing light and a sense of space to the interior. 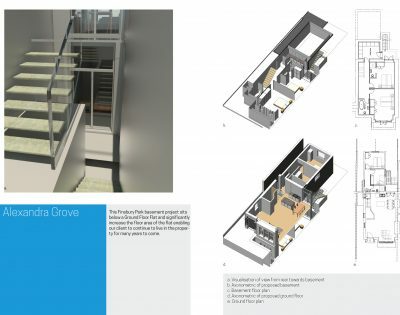 It also provides a series of very interesting spaces when the ground to basement stair is set at this zone allied to a connection between the reception rooms and the rear kitchen and garden beyond. 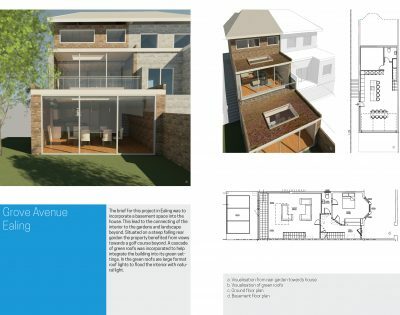 Shape Architecture has an excellent understanding of the issues relating to a successful planning permission. This is reflected in the number and range of projects we have undertaken and also the complexity of these projects. 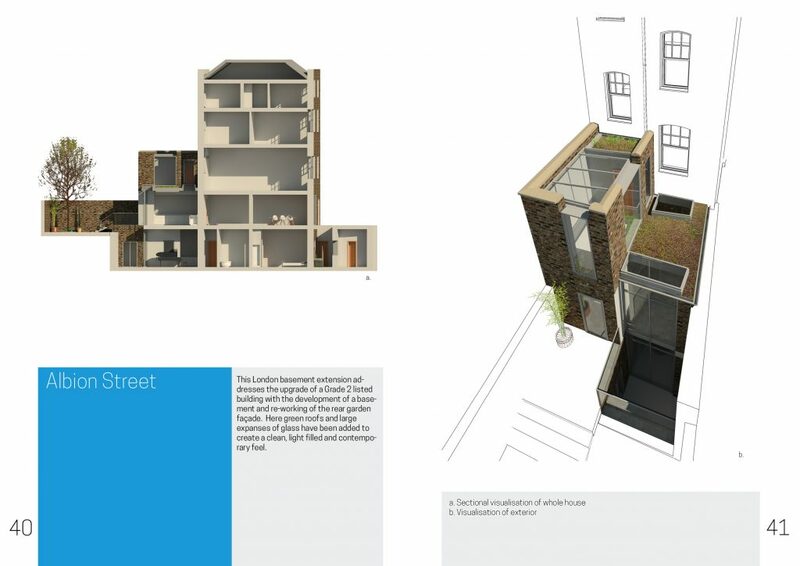 In Kensington we obtained planning permission for a double basement, located in a cul-de-sac and a conservation area. This London Basement is set largely below the existing rear garden and in part below a rear ground floor extension. 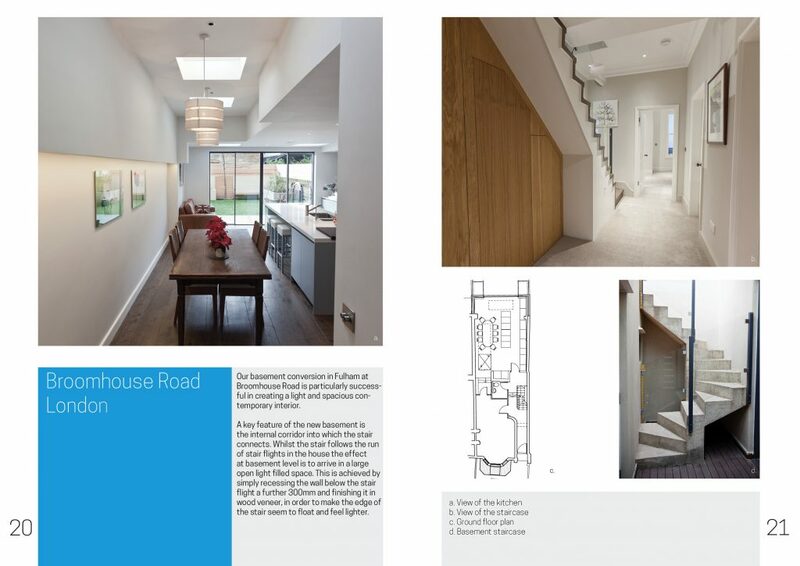 It follows another Barnes basement project at Nassau Road where we also secured planning permission for a below garden basement. 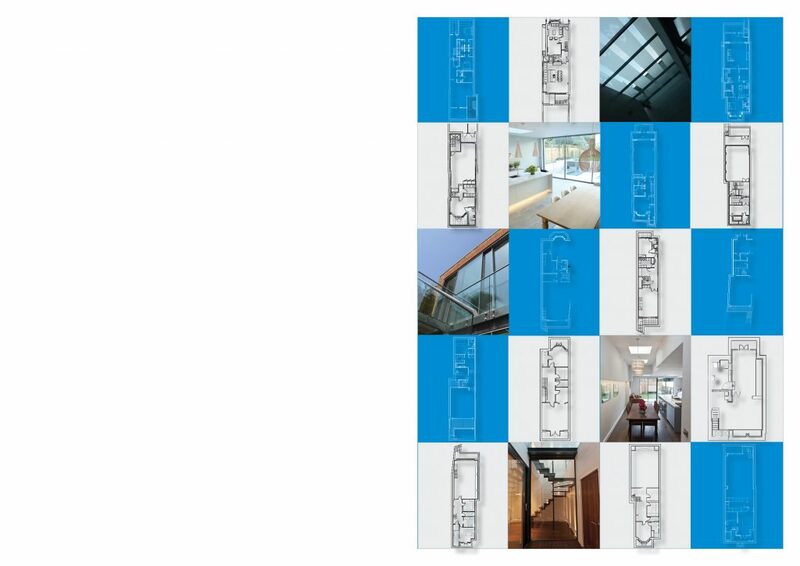 In each instance it is the location of the lightwell that is key in bringing light and ventilation into the basement and acting as the heart of a light filled basement extension. 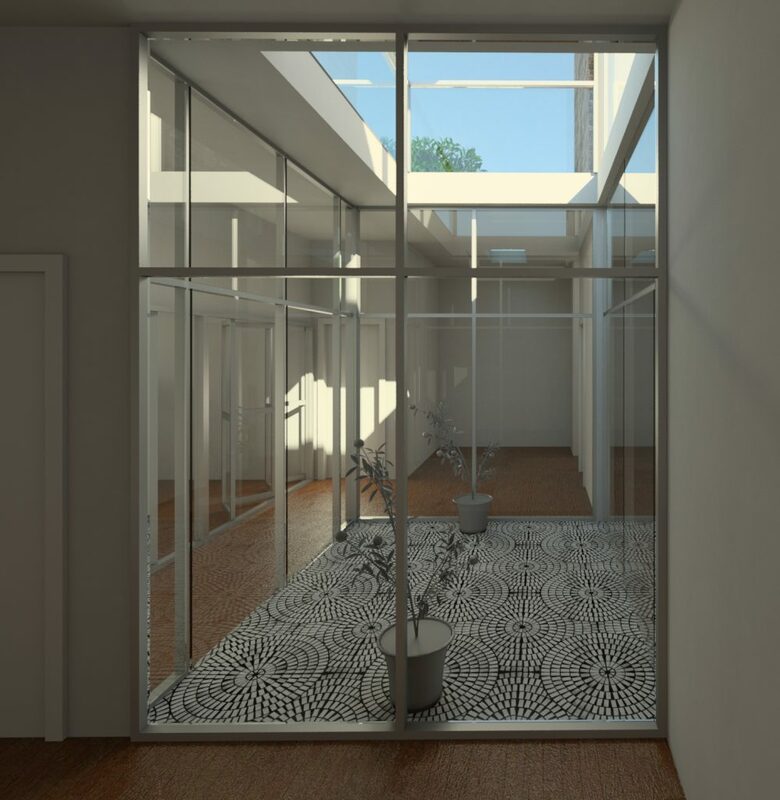 Our client had asked how to bring light into the basement and we were able to illustrate through a series of computer models that a central lightwell acting as a small courtyard garden at basement level would provide a great deal of light and a sense of openness at basement level. 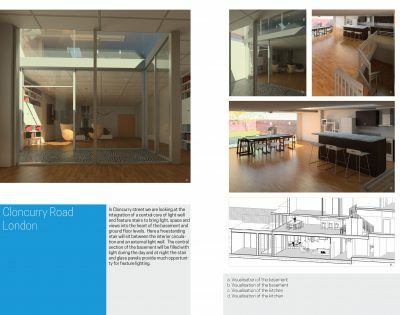 Several glass panels set in the paving above also reinforced the amount of daylight brought into the basement. 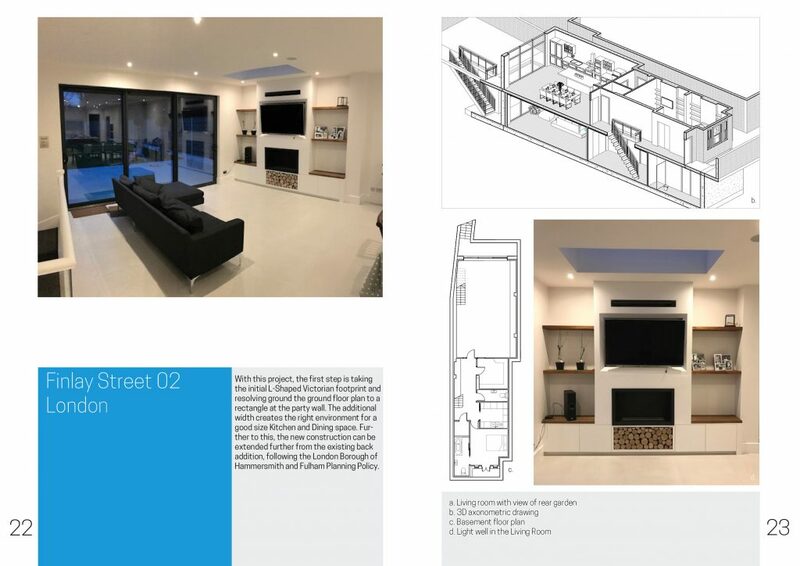 The clients brief for this Kensington project asked for a new basement below the whole building footprint and opening up of the ground floor to include the conversion of the integral garage into a part of the living accommodation. 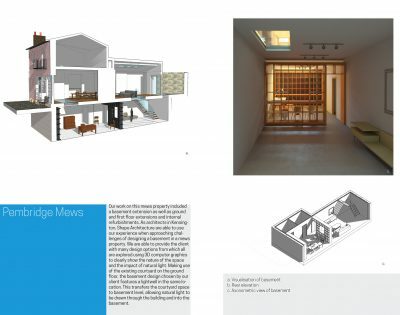 As this was a mews property, it presented the design challenge of how to bring light into the basement. 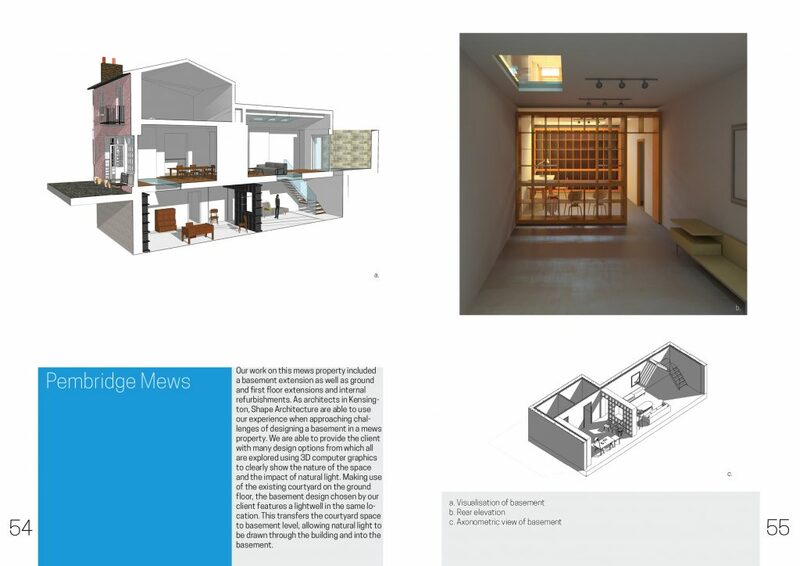 The existing light well was extended down as a double height space and this allows the rear and mid parts of the basement to be filled with light and provides a focal point. 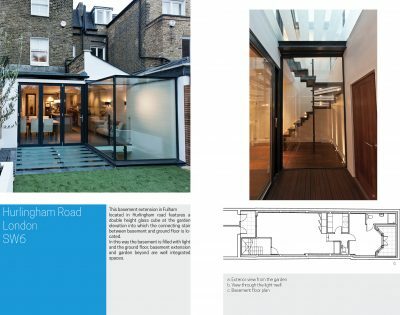 As architects for this basement extension and whole house refurbishment in Kensington, Shape Architecture obtained planning permission to return the building from four flats to a substantial family home. 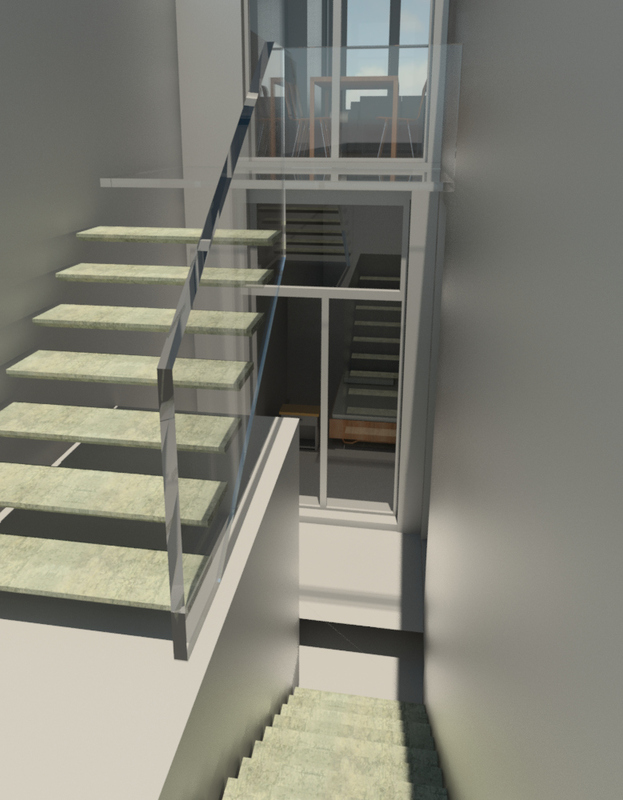 A feature stair will link the various levels of the building together and roof lights will flood the interior with light. Generous hallways set against external glazing ensure that the interior is always filled with light and that there is a great sense of space. 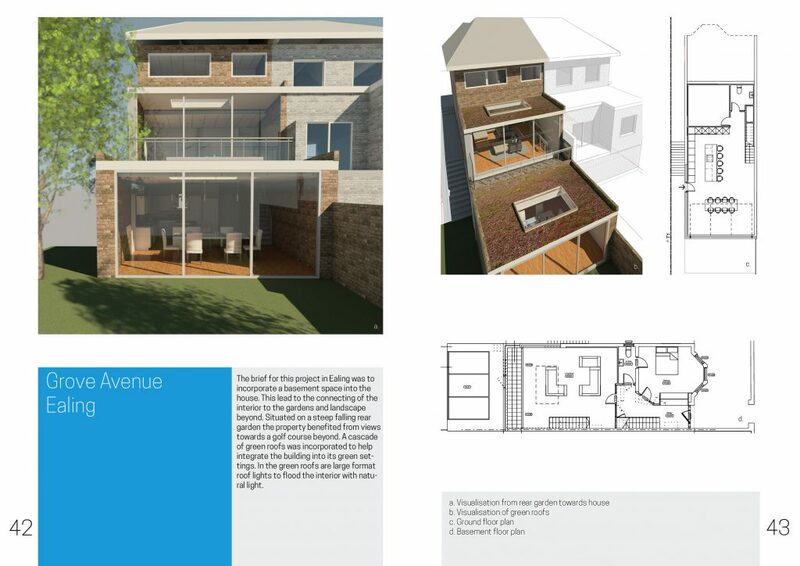 As architects in Kensington, consideration is taken to the thermal upgrade of the existing building fabric. This will reduce the heat loss through the walls and also improve the sound insulation of the house. 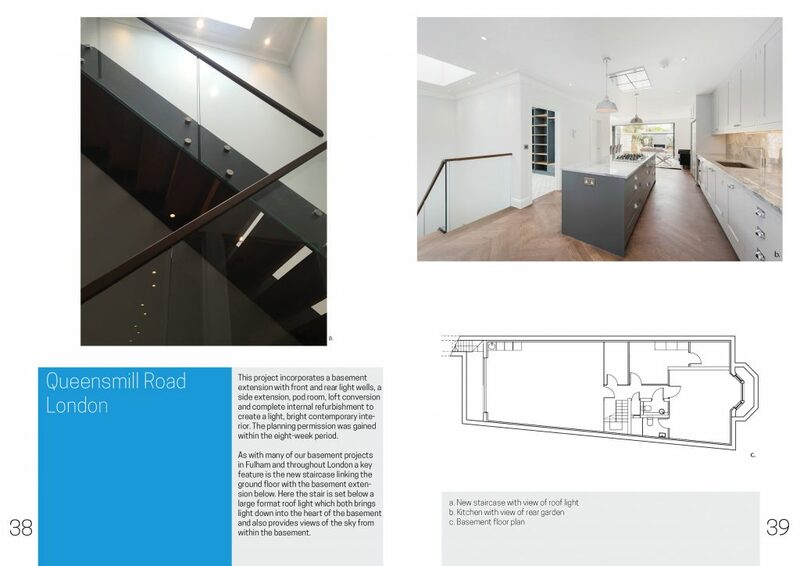 This project consisted of a basement extension with front and rear light wells as well as a side extension, pod room and loft conversion As with many of our other basement projects in London a key feature is the new staircase that links the ground floor with the basement. The stair is located below a large roof light providing views of the sky and natural light. 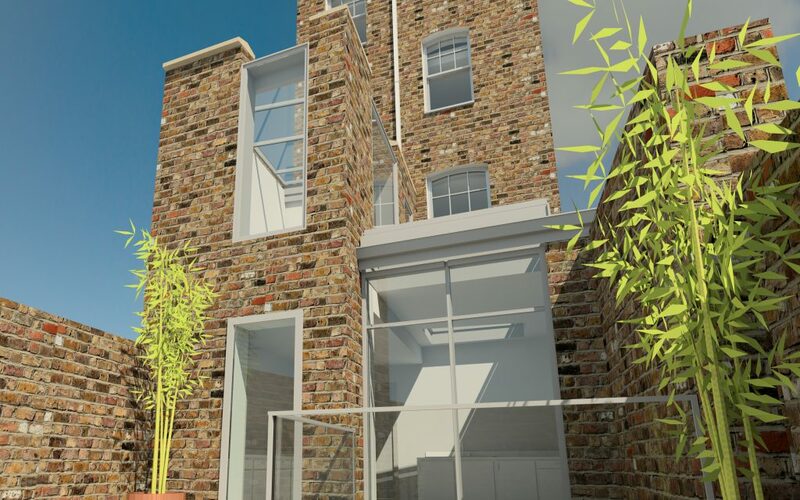 This London basement extension addresses the upgrade of a Grade 2 listed building with the development of a basement and re-working of the rear garden façade. 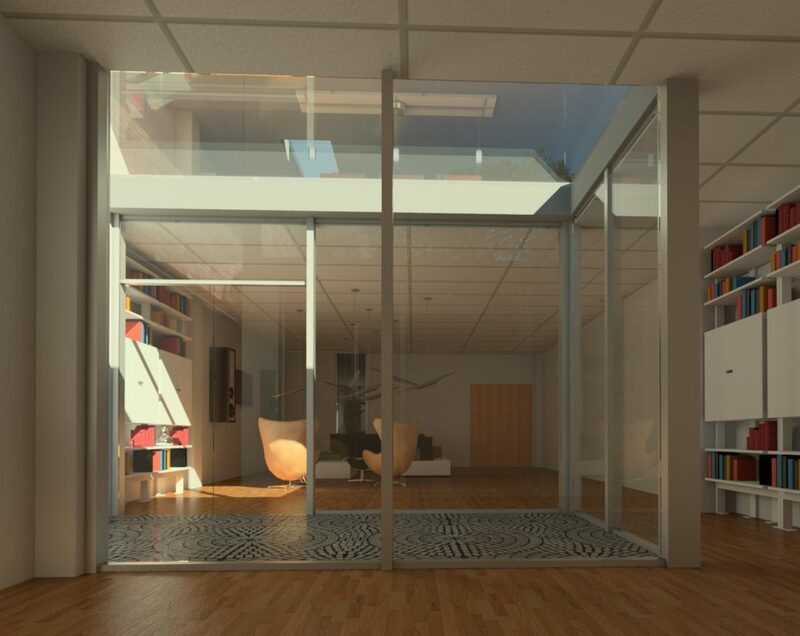 Here green roofs and large expanses of glass have been added to create a clean, light filled and contemporary feel. 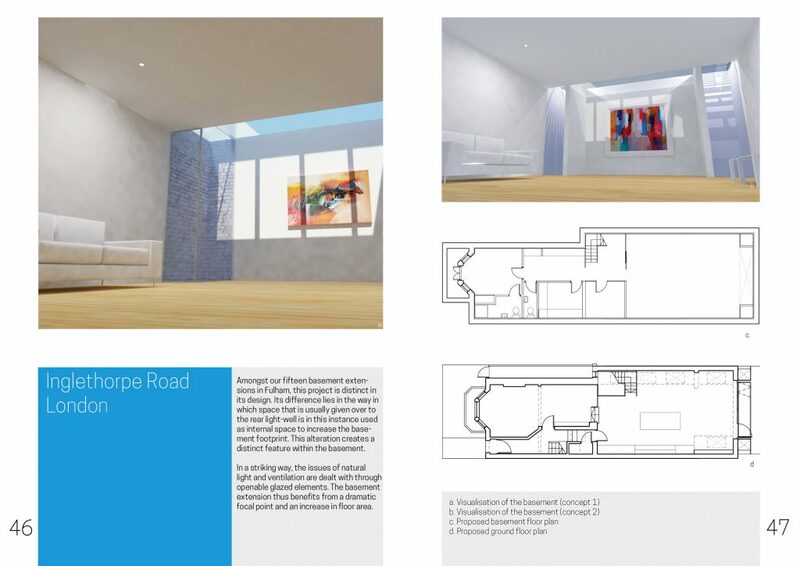 The brief for this project in Ealing was to incorporate a basement space into the house. This lead to the connecting of the interior to the gardens and landscape beyond. Situated on a steep falling rear garden the property benefited from views towards a golf course beyond. A cascade of green roofs was incorporated to help integrate the building into its green settings. 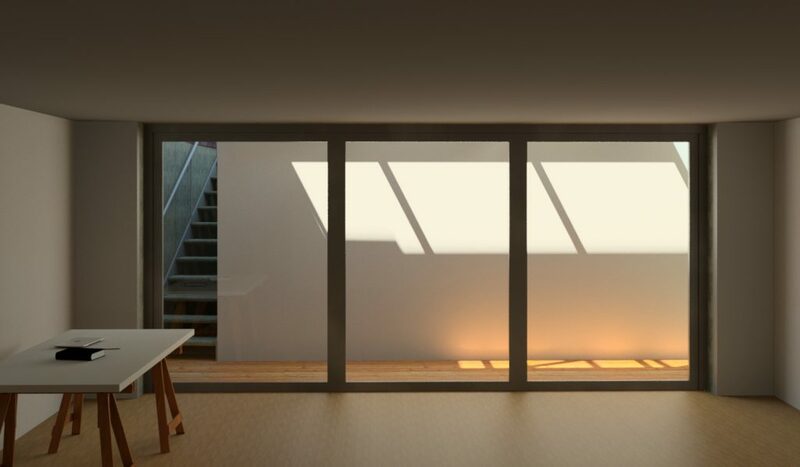 In the green roofs are large format roof lights to flood the interior with natural light. 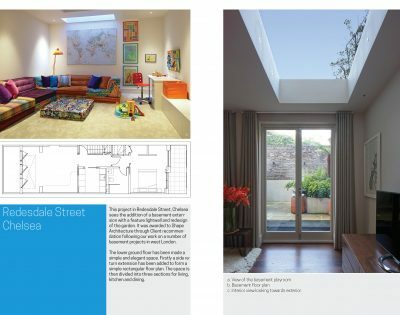 This London basement project in Clonmel Road includes a basement and associated lightwells, extensions at ground floor and roof level and complete internal refurbishment. 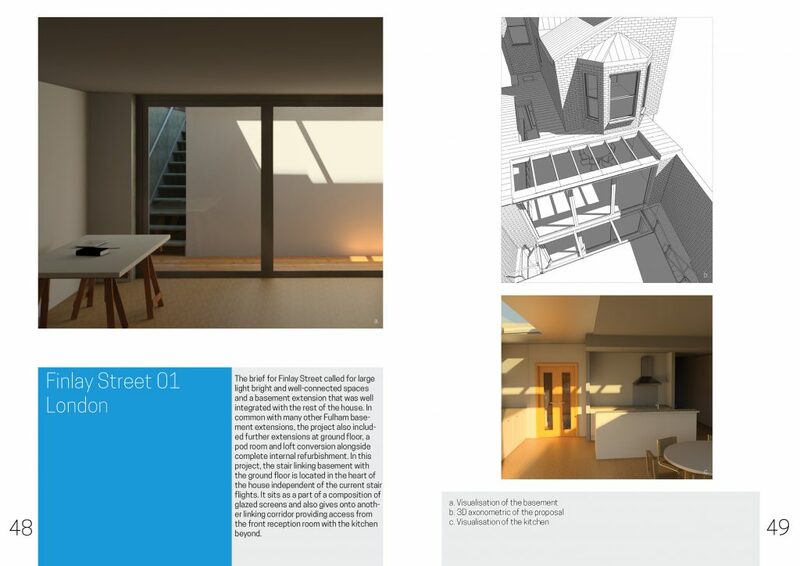 Our clients selected Shape Architecture having researched successful planning applications for similar basement projects in Fulham. 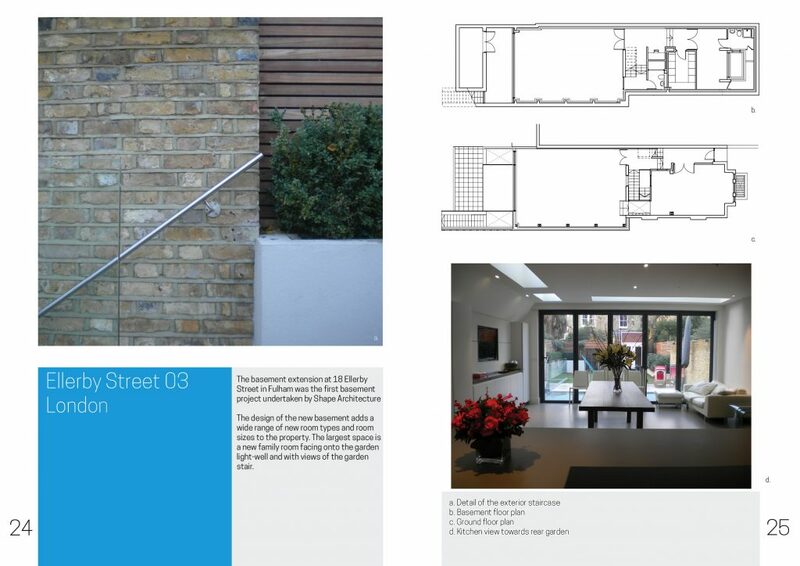 Our project in Inglethorpe Road is distinct in its design as one of our fifteen Fulham basements. The space below the rear light-well is used as internal space to increase the basement footprint. 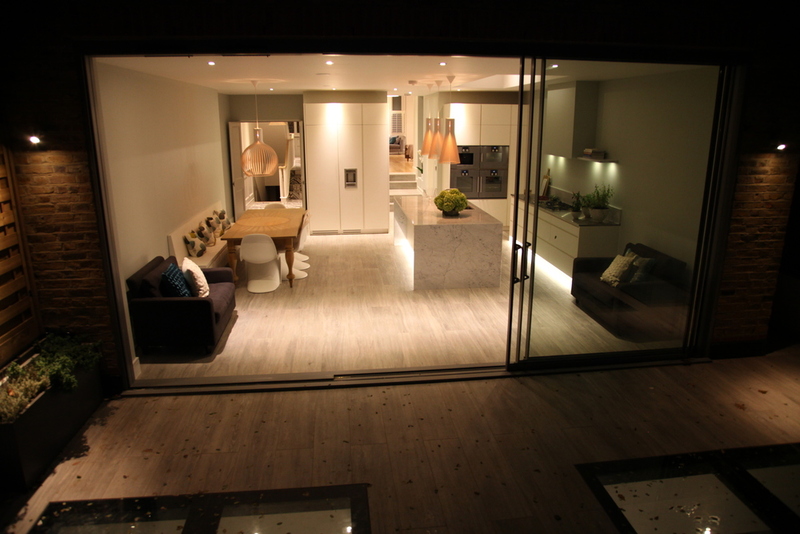 This feature means the basement extension benefits from a dramatic focal point and increased floor area. 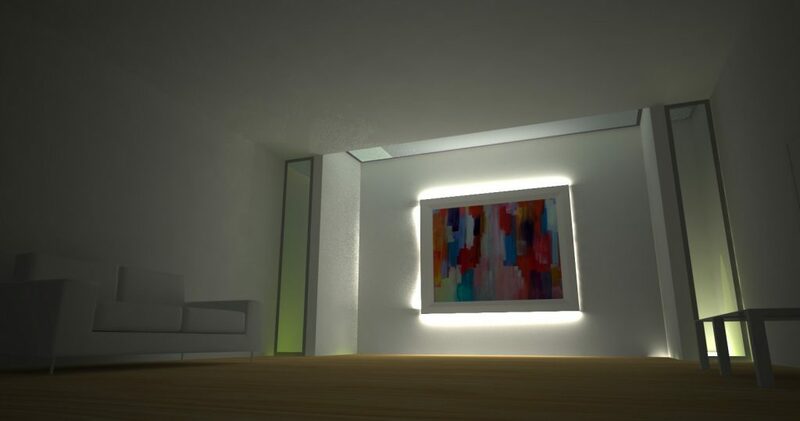 Internal Night Time Render of Basement at Inglethorpe Street. 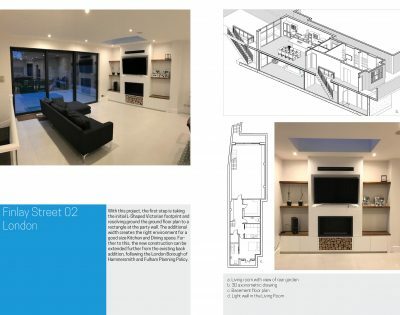 Similar to other London basement projects, this project also included further extensions at ground floor, a pod room and loft conversion alongside internal refurbishment. 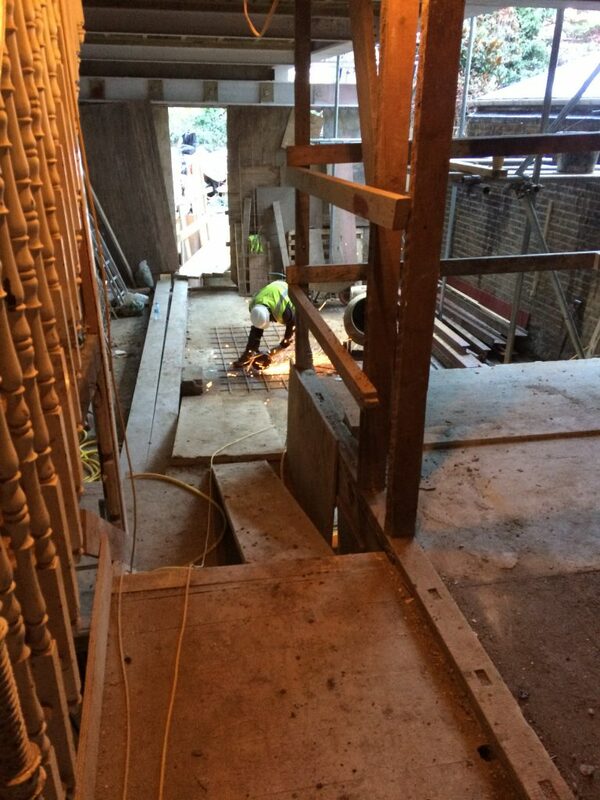 To ensure the basement extension is well linked to the rest of the house, the stair is located at the heart of the house. 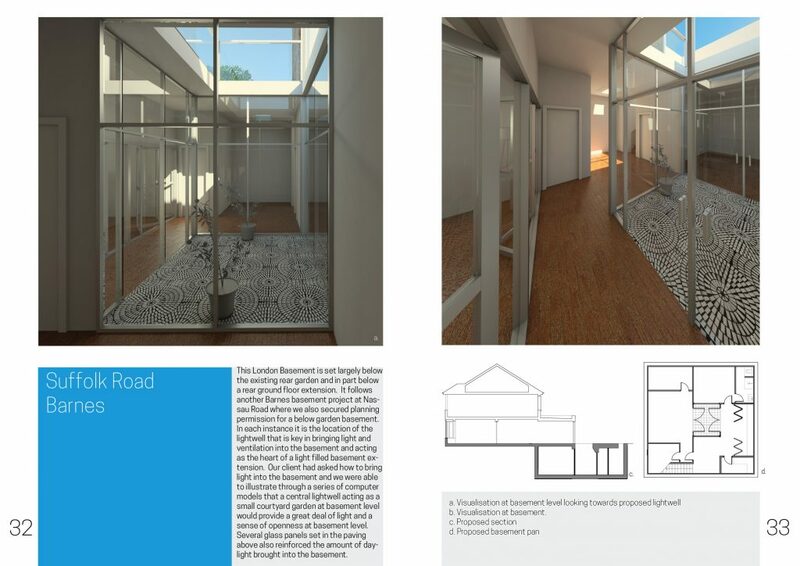 It sits as a part of a composition of glazed screens and also gives onto another linking corridor providing access from the front reception room with the kitchen beyond. 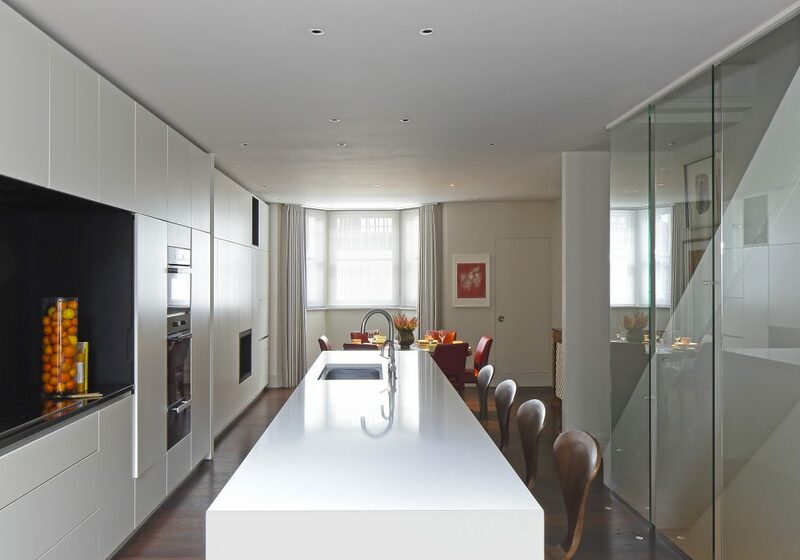 We have followed similar arrangements in other basement projects in Fulham, and it has always proved successful. 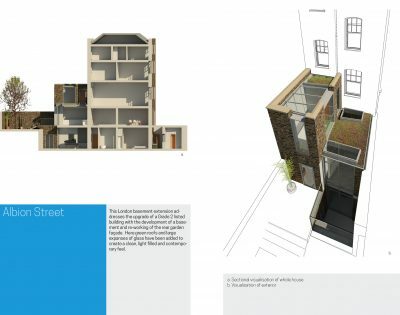 We have obtained planning permission for this London basement in Iverson Road in Camden. 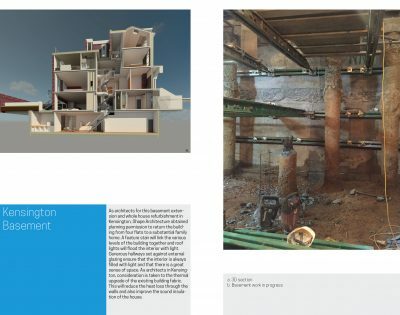 As with several other of our London basement projects this one is set below an existing Ground Floor Flat and exploits an already part dug undercoft. 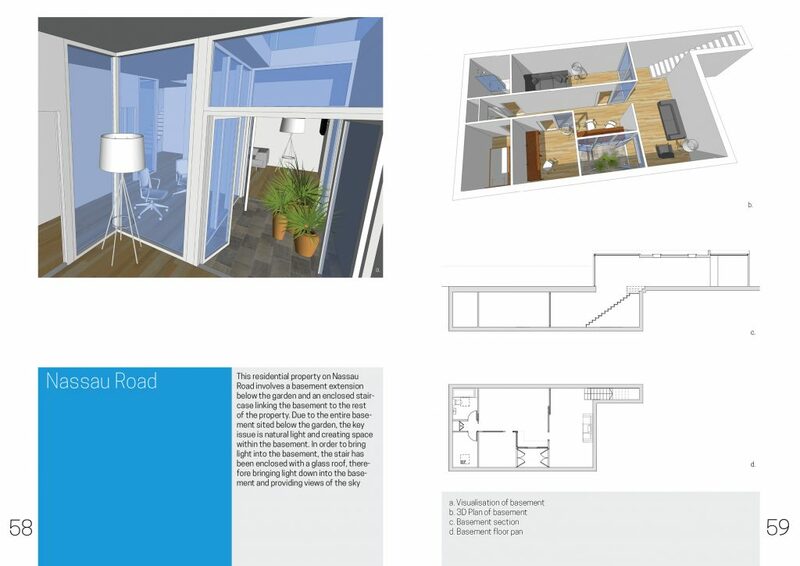 The basement does not extend under the whole property but with two lightwells it provides valuable light and bright additional floorspace. 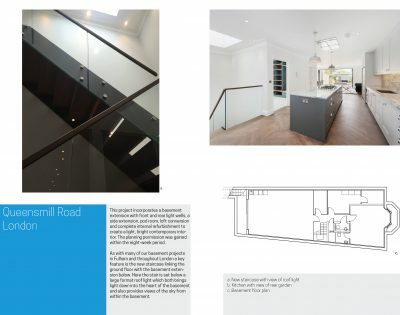 In Cloncurry Road we are looking at the integration of a central core of light well and feature stairs to bring light, space and views into the heart of the basement and ground floor levels. 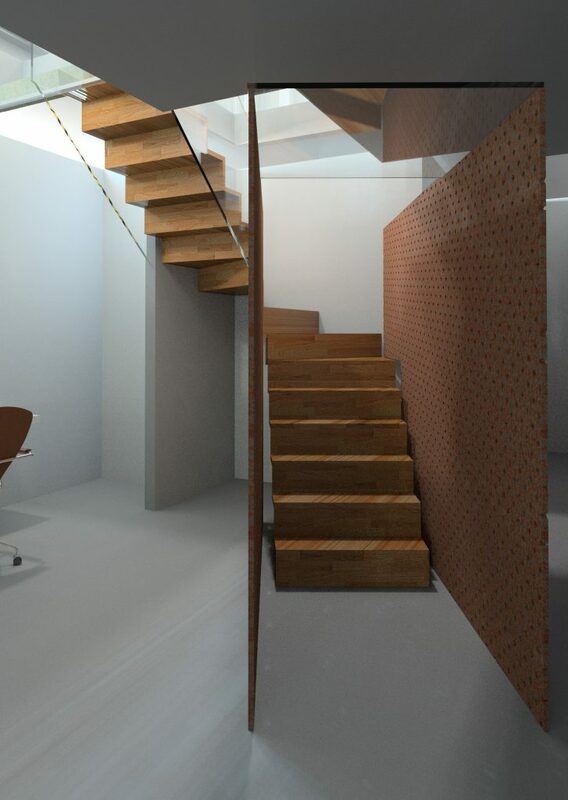 Here a freestanding stair will sit between the interior circulation and an external light well. 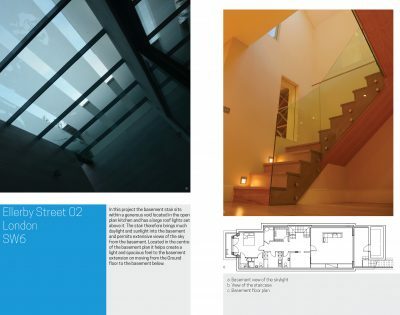 The central section of the basement will be filled with light during the day and at night the stair and glass panels provide much opportunity for feature lighting. 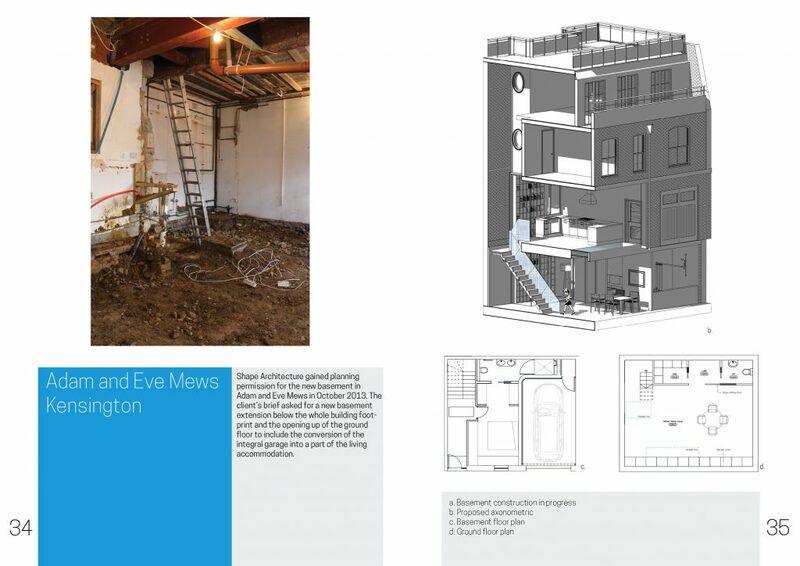 Our work on this mews property included a basement extension as well as ground and first floor extensions and internal refurbishments. 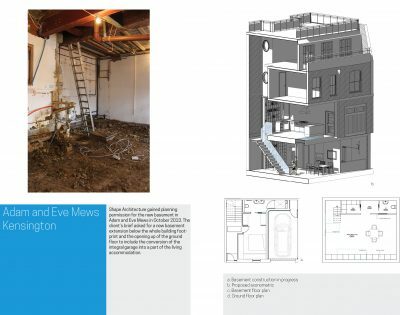 As architects in Kensington, Shape Architecture are able to use our experience when approaching challenges of designing a basement in a mews property. 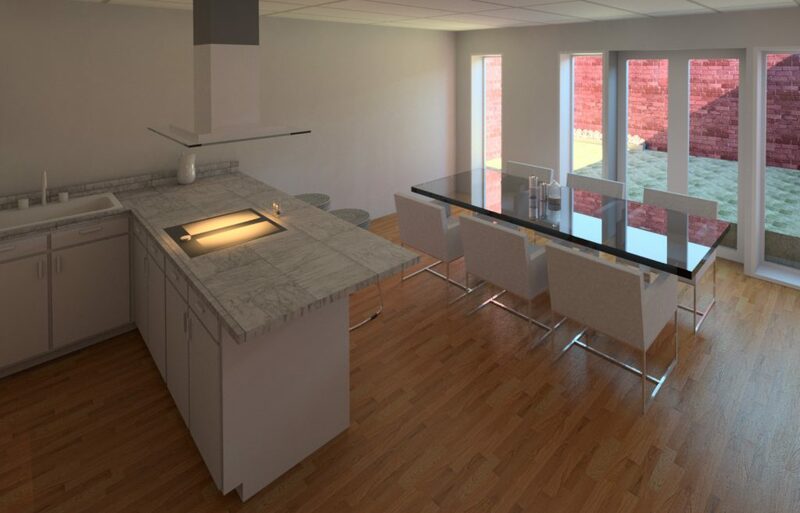 We are able to provide the client with many design options from which all are explored using 3D computer graphics to clearly show the nature of the space and the impact of natural light. 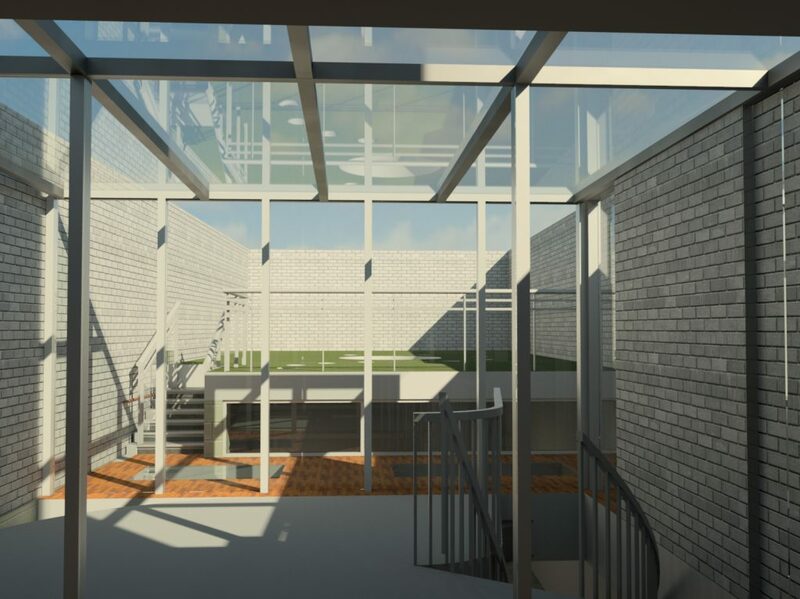 Making use of the existing courtyard on the ground floor, the basement design chosen by our client features a lightwell in the same location. 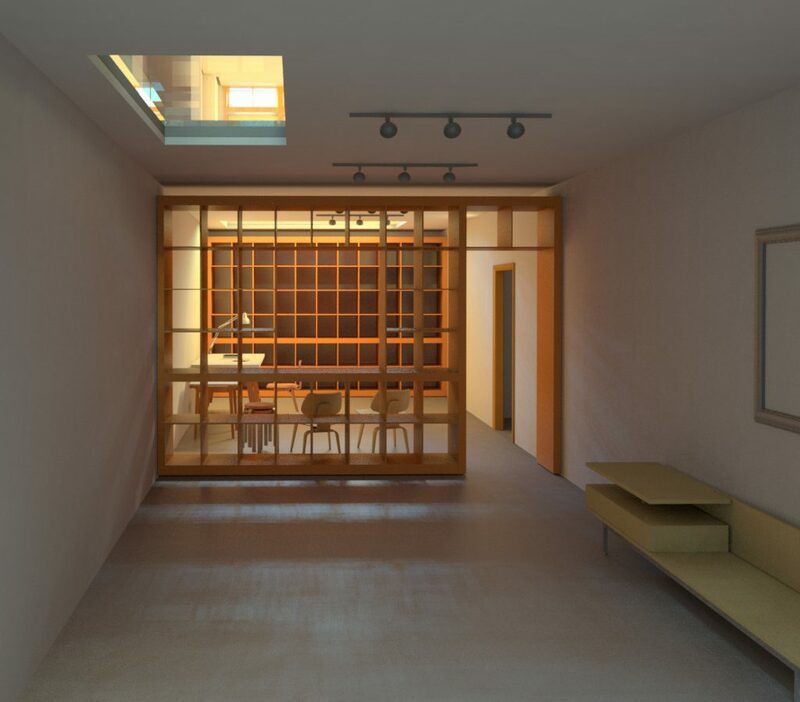 This transfers the courtyard space to basement level, allowing natural light to be drawn through the building and into the basement. 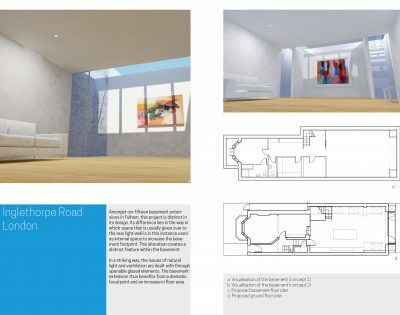 Ashington Road in Fulham saw Shape Architecture add a basement application into the planning submission when the client decided to expand our brief. 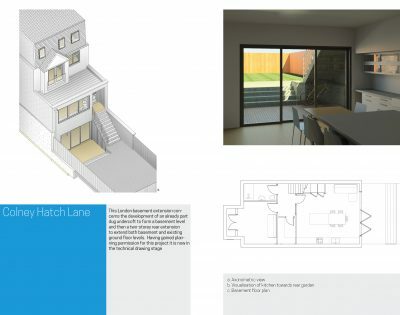 In this instance the basement would not be constructed straight away but rather the client wanted the benefit of the approval prior to selling the property. 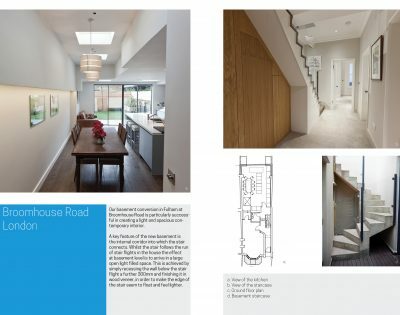 The project on Munster Road involved a basement extension below a ground floor flat as well as open plan living and dining space at the rear. The new basement space provided a gym and study area. 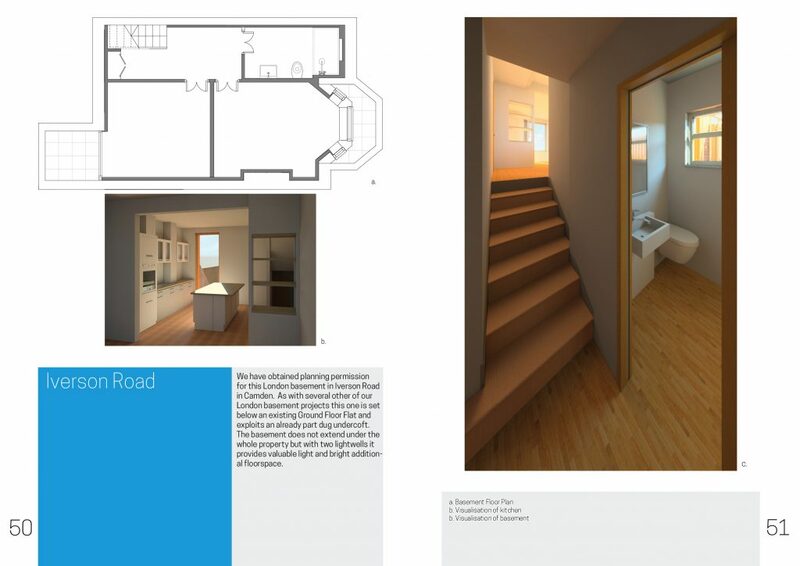 Our project in Newlands Park is a basement extension below an existing Ground Floor Flat. 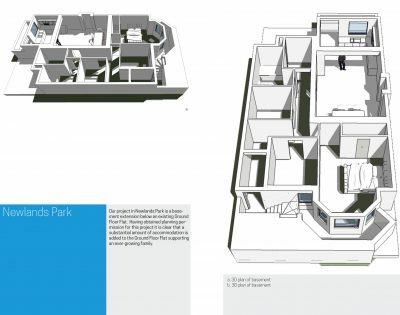 Having obtained planning permission for this project it is clear that a substantial amount of accommodation is added to the Ground Floor Flat supporting an ever-growing family.